Hey everyone ~ For those of you that don’t know me (let’s be honest, that’s probably all of you), I’ve been playing chess for around 10 years now, qualifying for numerous tournaments as a representative of both my state and the U.S. at the National Girls Invitational Tournament and the World Youth Chess Championships respectively. Compared to all those young prodigies that occupy the top scholastic ranks nowadays, I started chess relatively late – at the age of 8. And for almost an entire year, I lost just about every single game I played. 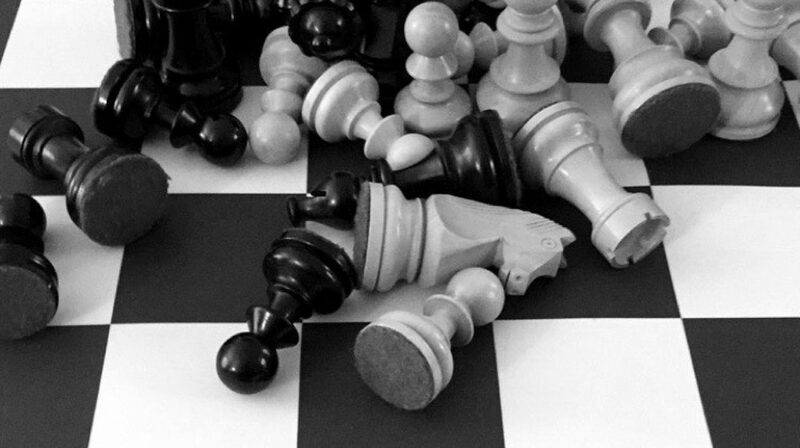 No joke – I spent most of 2nd grade as the worst player in my elementary school’s chess club. While I ascended to expert level relatively quickly after I finally learned how to checkmate, my years in high school have kept me there – it wasn’t until this last April that I finally reached 2100. Now, you’re probably thinking ,”Oh, she must have had more time to study or gotten a new coach or something to get to 2100!” I wish that were true (as it’d make going forward easier), but that’s not what happened. At all. Going into my senior year of high school, I hadn’t had a coach for around two years, I barely studied chess (if at all) since I was preoccupied with college applications, and I had previously decided that rather than focus on tournaments, I was going to devote my time to the NJ All-Girls Chess Camp that I had just founded. If anything, the only “change” that I committed to was growing older (which, let’s face it, wasn’t even a choice). However, against all odds this past March/April, I performed at master level at both Philadelphia Open and High School Nationals and broke 2100. But how? Maybe I magically adopted a better understanding of chess. Or maybe I was just incredibly lucky two tournaments in a row. Ultimately, I’ve learned that even if your rating is not going up, the experiences you get help you improve, and the pressure that comes from performance expectations doesn’t help. 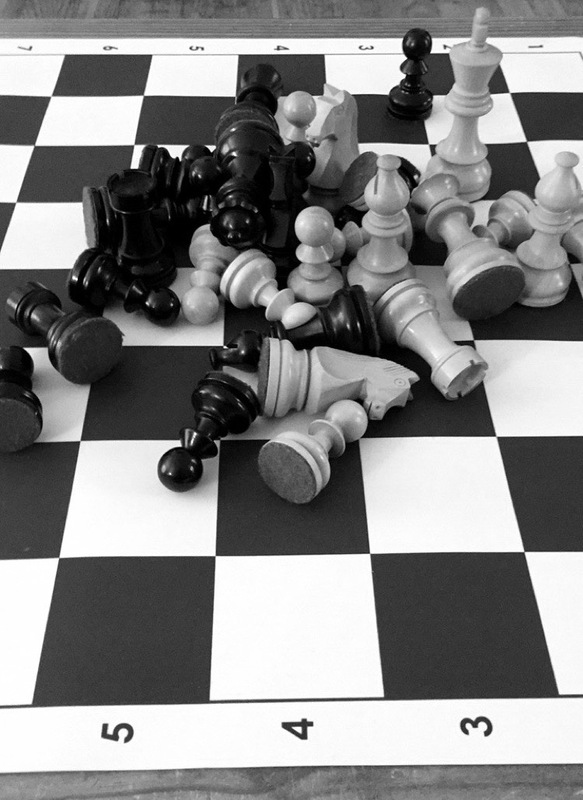 All we can do as chess players is take the games one at a time, and worry about what move to make next. 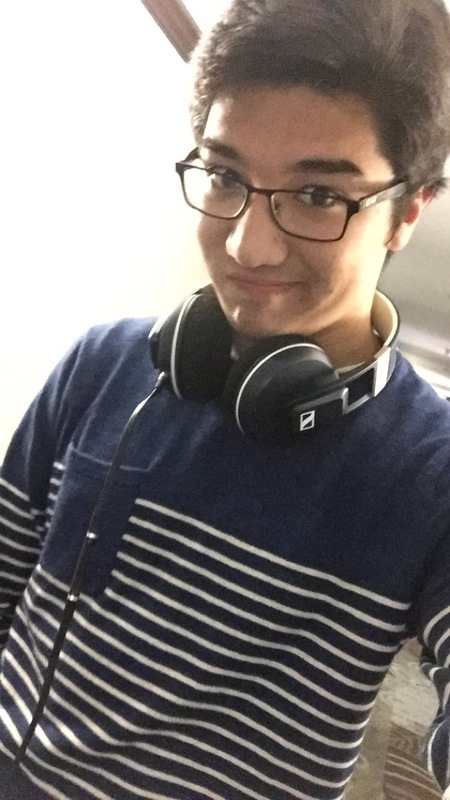 Hi everyone, welcome to the newest edition of Chess^Summit! As I mentioned in my last few posts prior to the US Junior Open, I’ll be adding three ambitious players to the site who you’ll get to know very well in the upcoming weeks. While the four of us may have somewhat similar goals, our unique perspectives and understandings of chess will make each of our journeys to the next level vastly different. I’m really excited to continue sharing my own experiences here on Chess^Summit, but with the added twist that I too will now get to learn from this site that I created two years ago. A great line-up for our opening two weeks. Our first two guest authors will be my coach, Grandmaster Eugene Perelshteyn, and International Master Alexander Katz. Don’t miss out! With the US Junior fully behind me, I’ve had some time to assess my play and consider new goals for the remainder of the summer and beyond. Knowing from personal experience that setting a goal to win a tournament is perhaps not the greatest idea, it would seem as if setting a rating goal would be rather appropriate. However, even this has its flaws. When looking back on my tournaments in NYC, Washington DC, Charlotte, and New Orleans from earlier this summer, I think it’s clear that I’ve made progress in various aspects of my game, yet the mere 13 rating points I’ve tacked on seem to speak against that. So worrying about the number and not my own play seems a little silly. But the question still remains, what will my goal be for the upcoming months? As of today, my goal is to become a National Master. Of course, there is the inherent flaw that this specifically means breaking 2200. In order to work around this, I’m going to purposely avoid checking my rating, calculating my performance at the conclusion of a tournament, and looking at my opponent’s rating before the start of each round. My dad has agreed to notify me when I break 2200. I think this will be very difficult for me at first, but hopefully, it will mean that all that matters is the quality of chess that’s being played over the board. Photo from the US Junior Open. 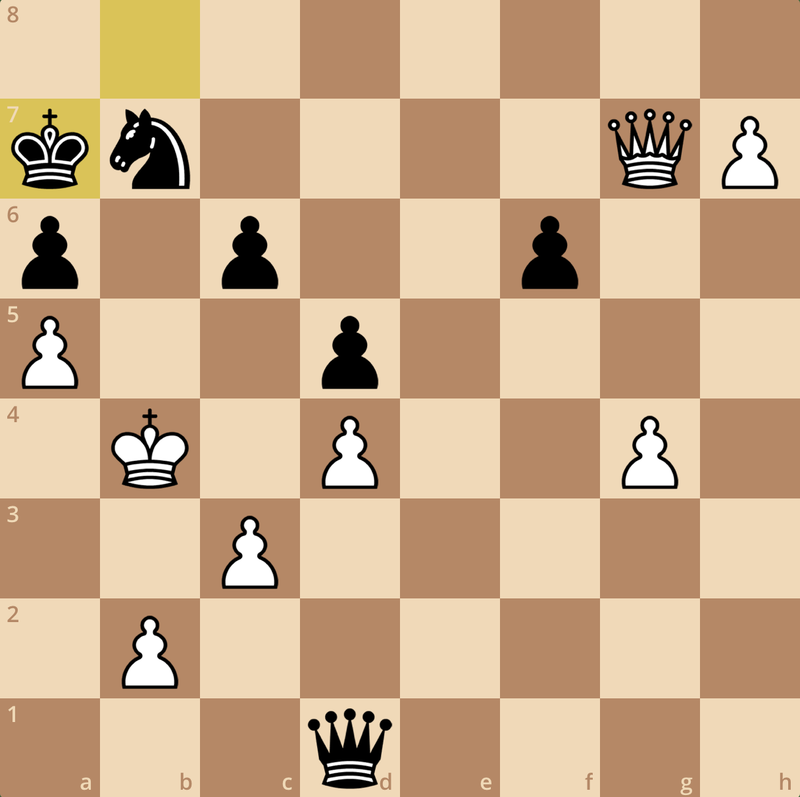 I actually got a couple mentions in Chess Life Online here! So what specifically am I going to work on to become a National Master? Personally, I think it would be a grave error to not focus on improving my calculation skills. While positionally I have matched reasonably well with stronger opponents this summer, in several key moments my own short-sightedness has proven itself toxic to getting the satisfying result I desired. While improving my tactical skills will help me become more precise, improving my mental fortitude will help me achieve the state of mind I need going into each game. Keeping a clear mind throughout each tournament will help me remain relaxed and focused on playing my best. By eliminating outside distractions such as ratings or performance, I hope I can directly improve my concentration at the board. So enough abstract – let’s talk chess! I’ve got a gruesome double-header coming up in Philadelphia, as I’ll be competing in the Open section of the World Open, followed by a tough Philadelphia International. I’m going to take some half point byes, but I believe it will still be the most number of rated games I have ever played in an eleven day period. I will be sharing my overall performance in my next post on July 12th (two weeks). Meanwhile, I decided to dig up a past game I’ve played that I thought was worth sharing. 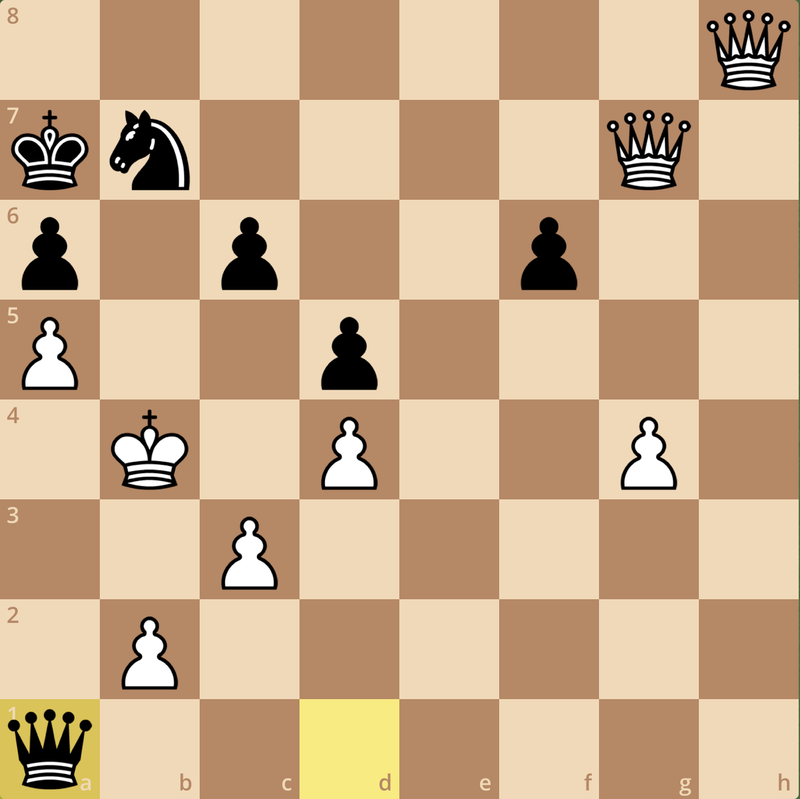 A Four Pawns Attack, which if I’m not mistaken was Sean’s (and still is) pet line against the King’s Indian Defence. I believe I briefly mentioned this game when I first launched Chess^Summit back in 2014, but without any analysis or diagrams – what a disservice to what might have been the best game I played in all of 2013! A backwards knight move? Again, I think 10… Nbd7 makes a little more sense, but with the pin on f3, the position will transpose. This move serves a few functions. 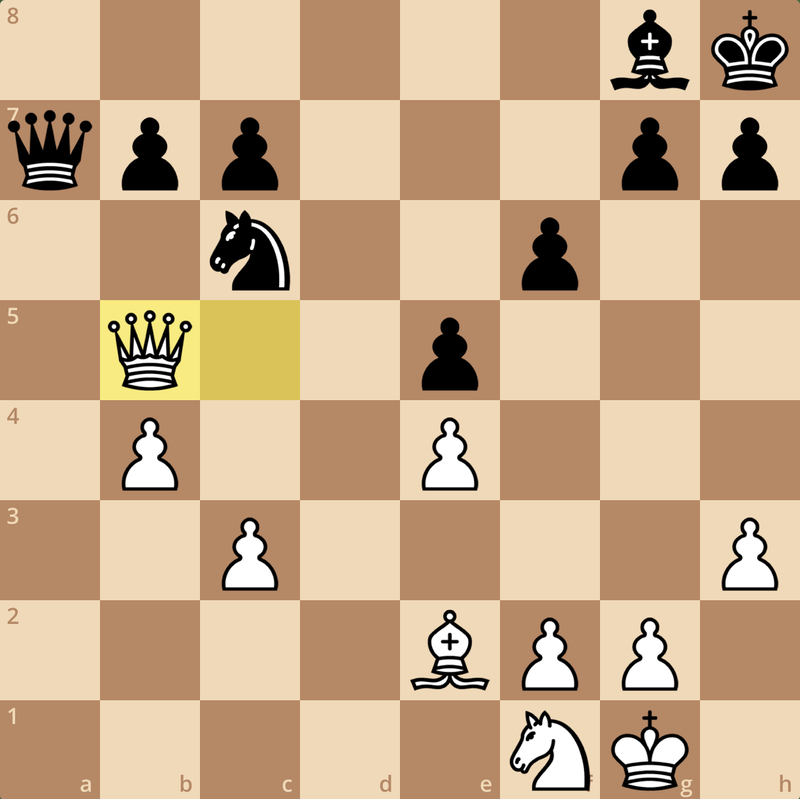 First, my g7 bishop now covers the e5 square. In these Benoni positions, it’s absolutely critical to not allow White to break open the position with an e4-e5 push. With the pin on f3 and a knight coming to d7, White cannot hope to immediately take advantage of my lack of development. Next, my knight on e8 will reroute itself to c7 to help support a …b7-b5 thrust. 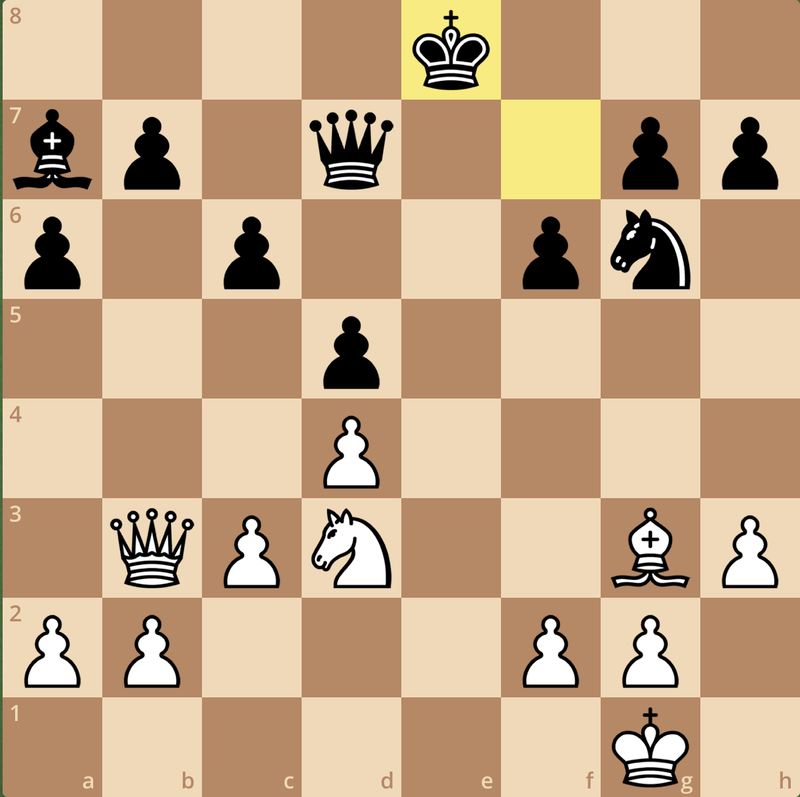 By bringing my knights to the queenside, my goal is to take advantage of some of White’s dark squared weaknesses such as the d4 square or the b2 pawn. 11. Be3 Nd7 12. h3 Bxf3 13. Qxf3 a6 14. a4 Nc7 15. Qg3?! Admitting the mistake. This is a hard thing to do, even for much stronger players, but unfortunately this it just too passive given the nature of the position. I remember thinking that White could have been better off here playing 19. Rfa1 during the game, ditching the b2 pawn for the a6 pawn, but after 19…Rxb2, the c3 knight is hanging, giving me some nice discovered attack potential on a1 once the knight moves. With my more experienced eyes, I have a strong feeling that this bishop on e3 is misplaced, as it means a rook on e1 cannot support a future e-pawn push. 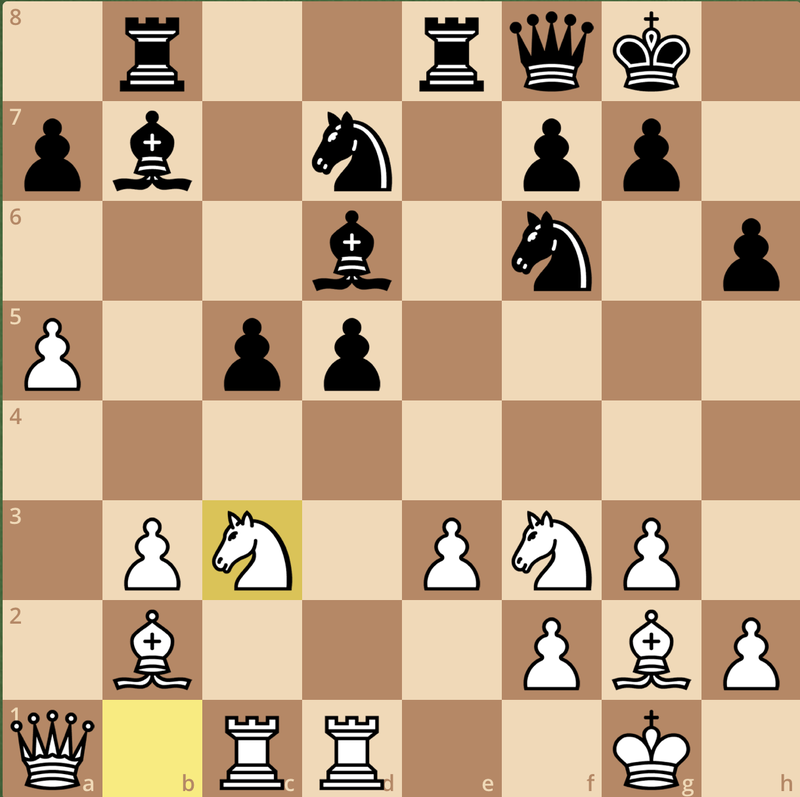 One mentality when playing against the Benoni is to avoid opening the queenside structure, surrendering space for the sake of time elsewhere. 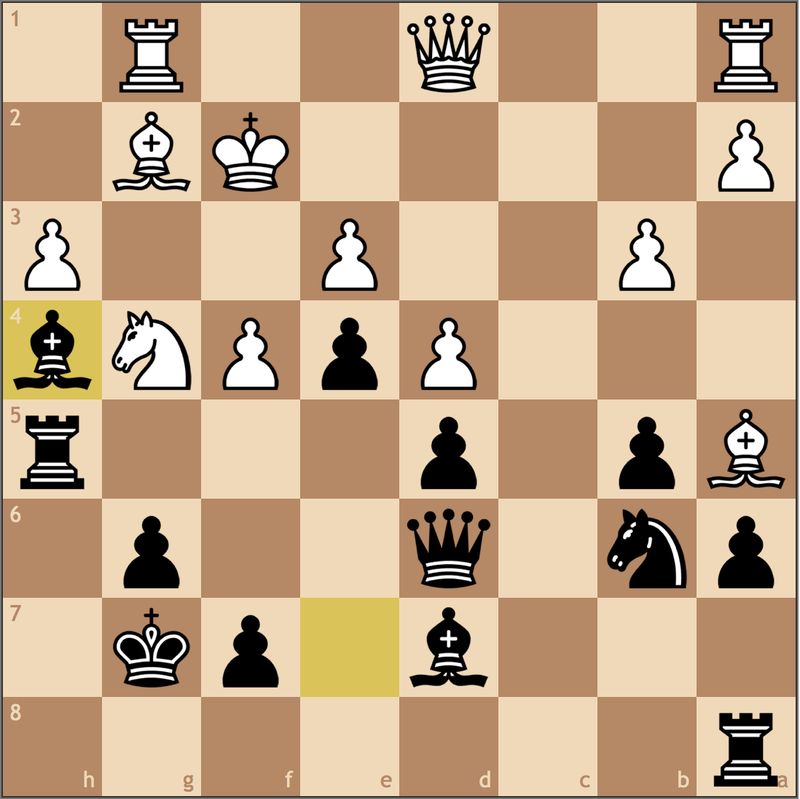 Thanks to some of my research with National Master Franklin Chen prior to the US Junior Open, I’ve found that in similar main line Benoni positions (1 d4 Nf6 2. c4 c5 3. d5 e6), sometimes it’s best to omit a2-a4 and ask Black what his intentions are. 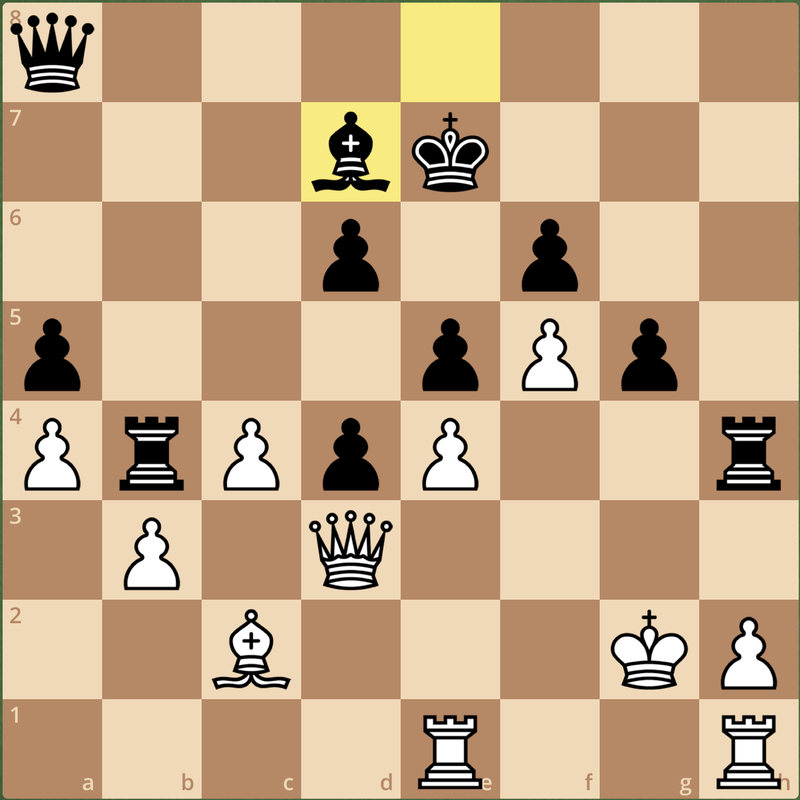 With some deeper analysis, I’ve found that while 14. a4 was perfectly fine, perhaps the insertion of 16. a5 hurts White strategically more than it hinders Black’s expansion. 19…Rb3 20. Bxa6? 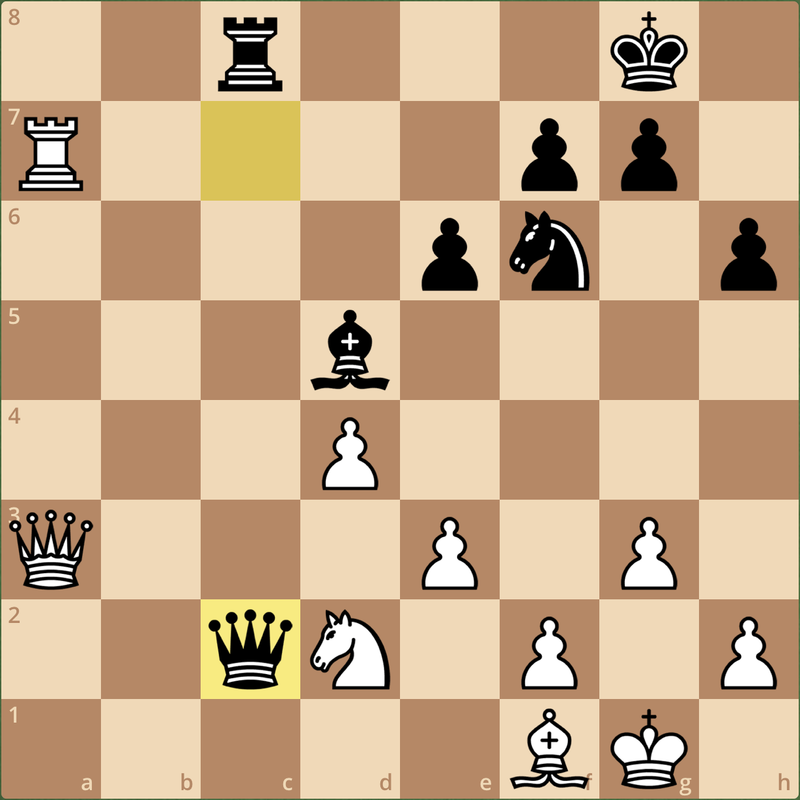 A cute finish for a game that had long since been over (…Bg7-d4 is coming if the queen recaptures). If I played a game like this now, I think I would label it as nothing special, but as an 1800 picking up my then career-best win, I remember this game being a huge confidence booster for me at the time. With proper opening play, strategy always prevails! For today’s game, I decided to choose a three-year-old game to celebrate the beginning of what I hope will become a fun project here at Chess^Summit. 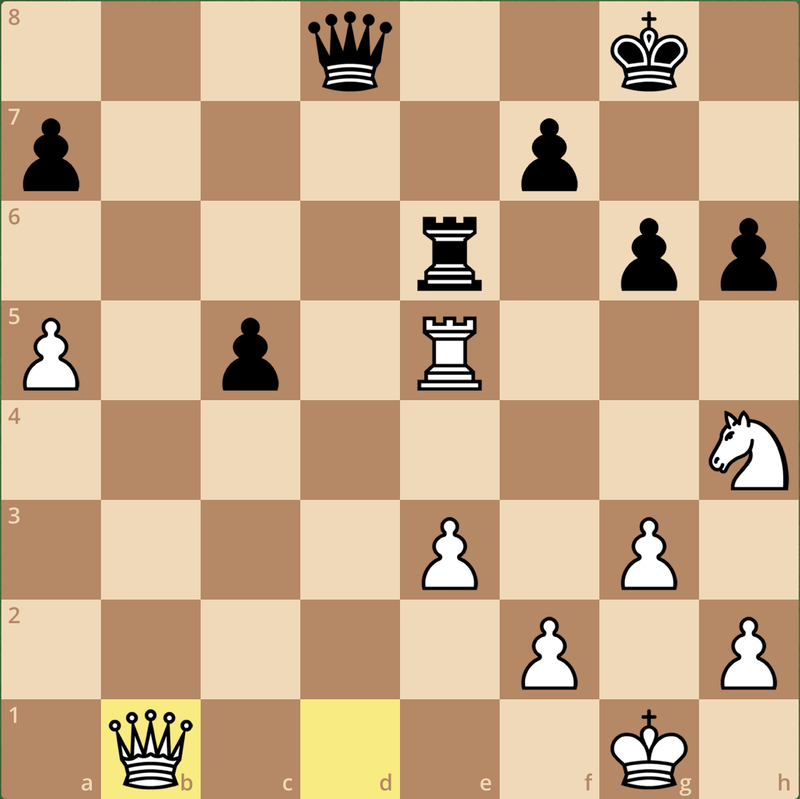 One of my motivations to invite new authors to this site was to present you with some elements of chess that are lost in the near perfect play of grandmasters. To become a strong player, you must have a full working understanding of positional and strategic imbalances, and here on Chess^Summit, we hope to present you with new ideas through the lens of our own improving understandings of chess. While we won’t be showcasing every great moment of the careers of Karpov, Kasparov, or Carlsen, we will be sharing instructive (and hopefully proud) moments from our own tournaments – even if that means going back a little in time. I hope you all enjoy the weeks to come here on Chess^Summit! These next two weeks should be a fun ride! Though finishing 7th with a score of 3.5/6 wasn’t exactly what I had been dreaming of, I think my performance at this year’s US Junior Open should give me hope going forward into the future. That being said, there’s always room for improvement, and as this weekend’s games have shown me, this has not changed. I had several opportunities to make my mark in this tournament, playing both of the eventual winners, but in critical moments I had lapses of judgement, ultimately costing me the game in each encounter. Part of this was nerves, I’m sure, but this is no different than any other tournament. If I learned one lesson from this weekend, it’s that you should never set a goal to be to win a tournament! These things just don’t happen on demand. 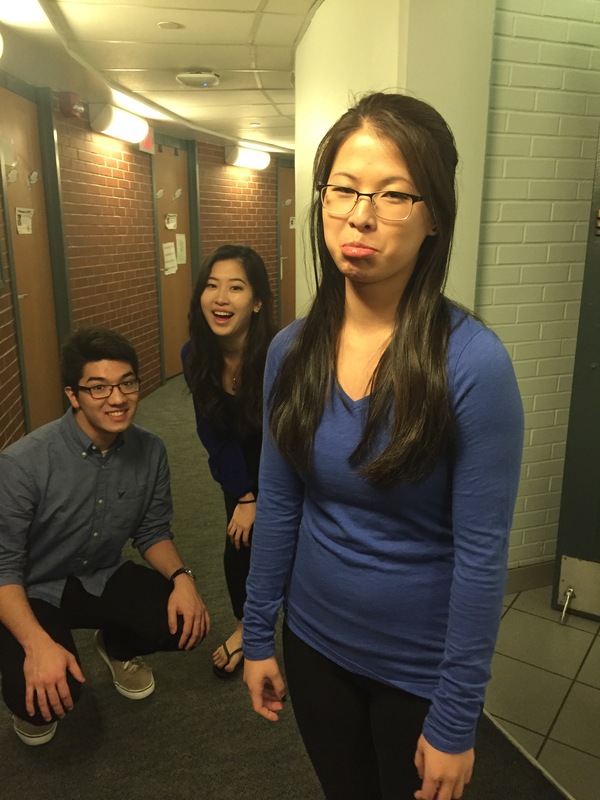 Despite putting in nine months of dedicated study and hard work, this weekend just wasn’t my best weekend. And it’s not like I haven’t improved. In the last nine months, I’ve gained roughly 75 rating points and earned the title of Candidate Master playing against tougher venues across the East Coast. I guess what I’m trying to say is that while my enthusiasm was in the right place, there were twenty-four other ambitious players in my section, who I’m sure were also keen on winning the event. Clearly there can only be at most a few co-winners, and I’m sure if this exact section were to meet again a month from now and play, the final results would be somewhat different. We can’t control when we play our best, but we can focus on continuing to improve, and as my coach has been trying to tell me, do the work and the results will come! Maybe my breakthrough tournament is next month, or next year, or maybe it was even in New York City just a couple weeks ago. While the US Junior Open has concluded, I still have many opportunities to make the most of my preparation for this tournament in future events. That being said, let me highlight some of the key moments of this weekend. My first round game proved to be rather simple, as my opponent offered a few pieces out of the opening and fell apart quickly. Though I’d usually be annoyed with such a pairing, sitting at the board in a risk-free round helped me relax and become acquainted with the tournament hall. Opening the tournament with a win? Done. Now it’s time to go to war. In my next game, I was already paired up against the eventual co-winner of the tournament, though he may thank me for my error in reflection – I believe it was the closest he came to losing the entire weekend. 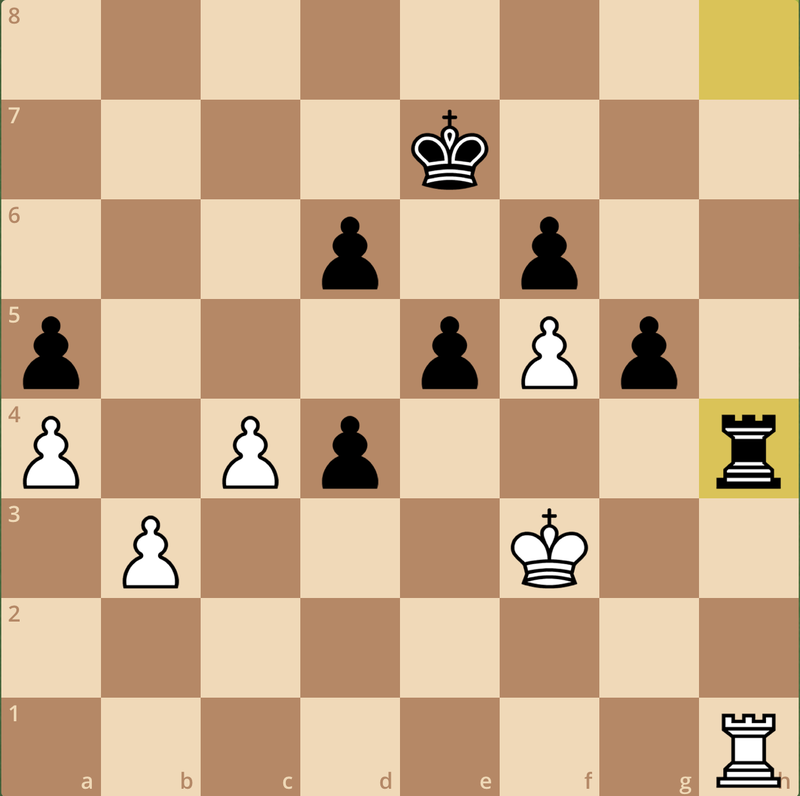 Here we have a relatively balanced position, with a long middlegame battle ahead of us. 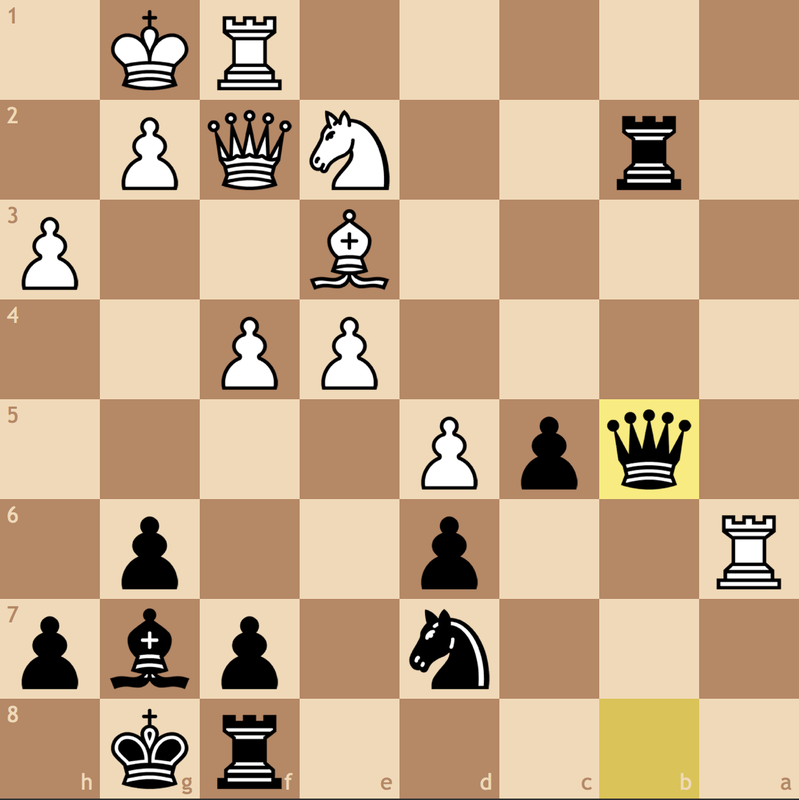 Black has the famous hanging pawns structure on c5 and d5, and while I may not have space, my set-up is solid and offers many strategic choices. Here I decided that my queen was misplaced on f5, and played 17.Qb1 with the idea of creating the Reti battery with Qf5-b1-a1 and putting pressure on the dark squares. One problem for Black is that I can continue to improve my position, while all of his pieces are on their best possible squares but lack concrete attacking options. 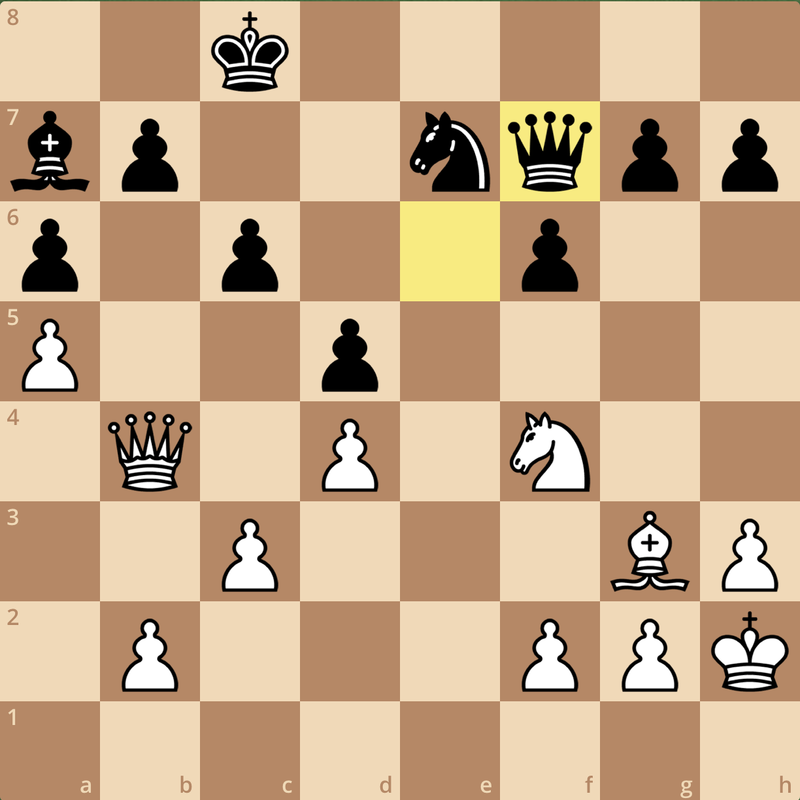 For this reason, my opponent spent half of his time on 17…h6? which is a practical mistake to have spent twenty-three minutes on this move! 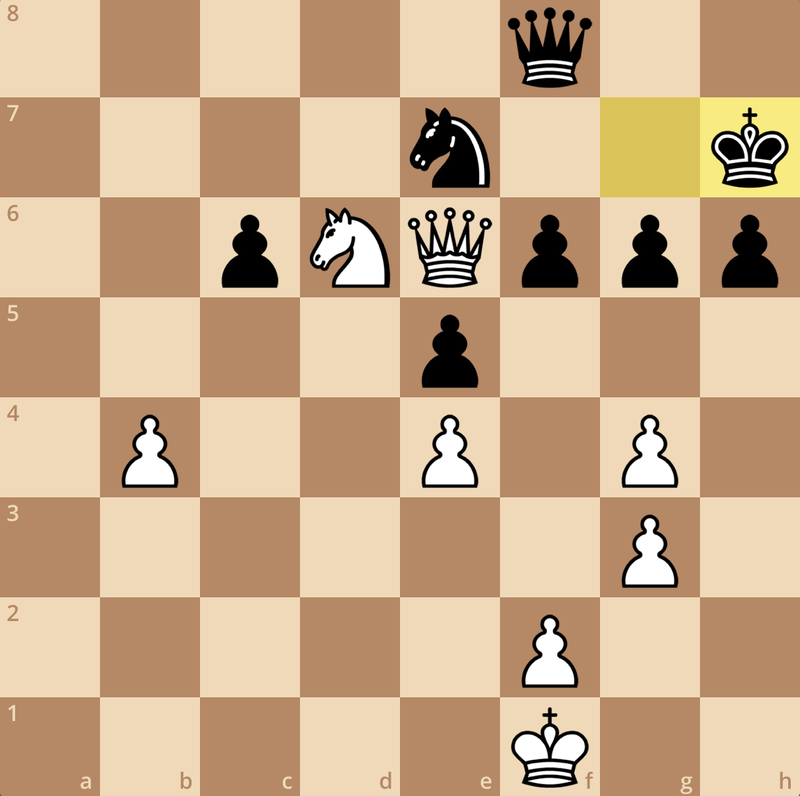 Black takes away the g5 square, but this is not within the realm of discussion for this position. Quickly, I took my chance to seize the initiative. 18.Qa1 Qf8 19.a4! 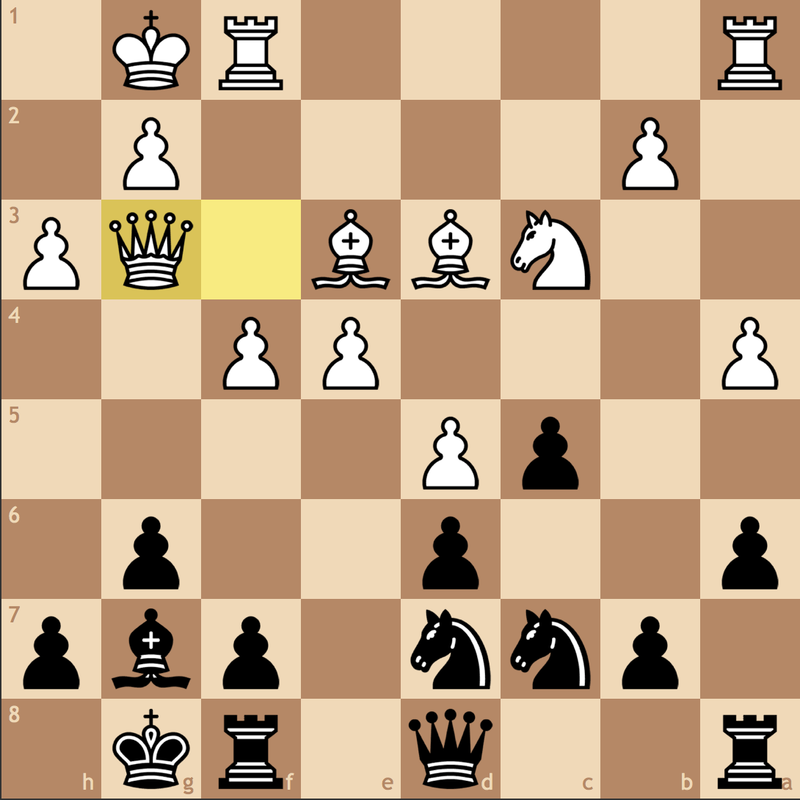 With my activity comes tactical problems for Black. Already, I’m threatening to take on g7, removing the defender of the d6 bishop. 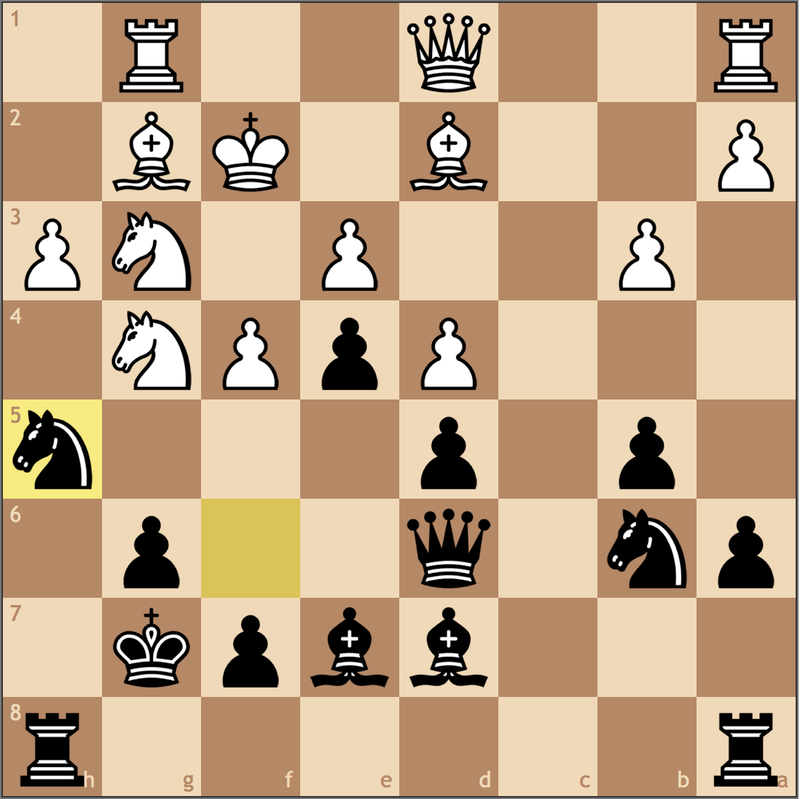 Furthermore, Black’s bishop is pinned to the d7 knight, so Black already must be careful to not hang material. 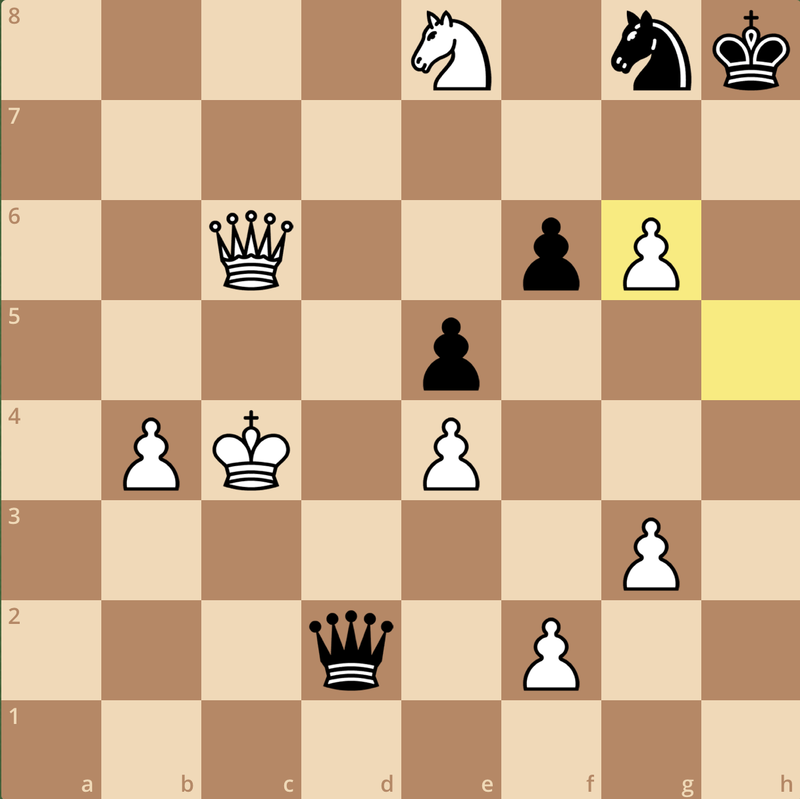 After this move, my opponent had minutes, if not seconds to complete the rest of the game. 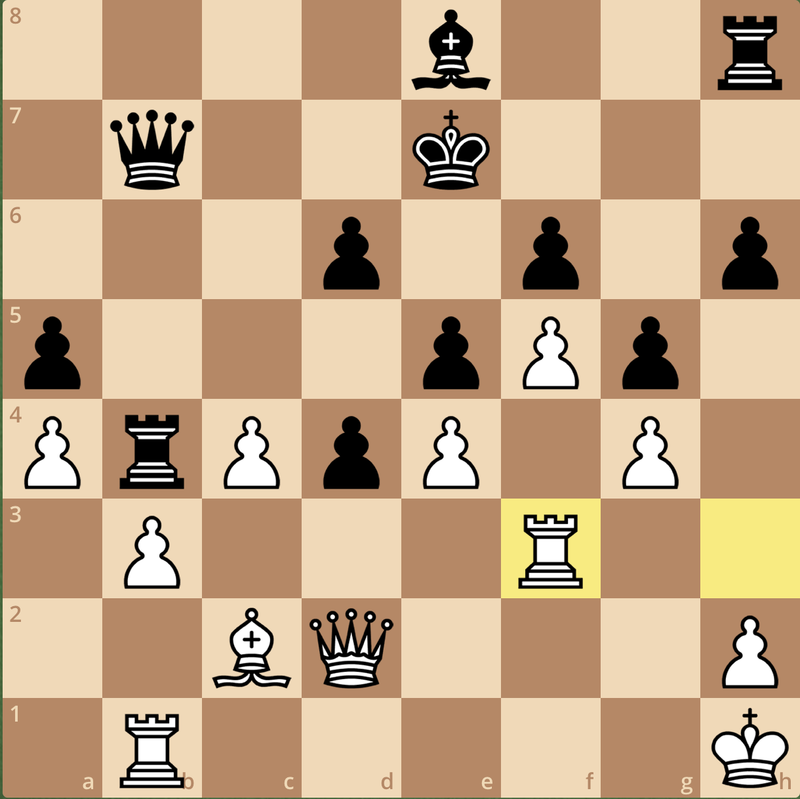 26…g6 27.Rcd1 Re6 28.R1d2! Hanging a knight, right? Maybe you can already start to see what I missed. 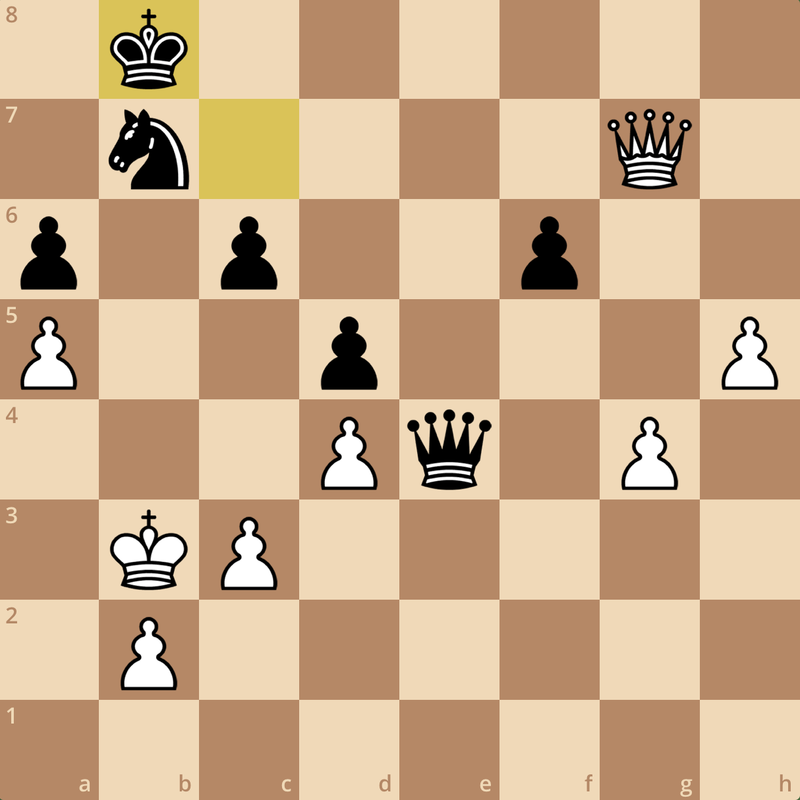 My initial reaction to this move was surprised because I had ruled out this option in my calculation of my previous move. In my head, I could hear myself saying “Black only had seconds left when he made the move and was looking really nerv- no this doesn’t matter!” And calculated here. My thought was 29. Bxe5 Bxe5 30. 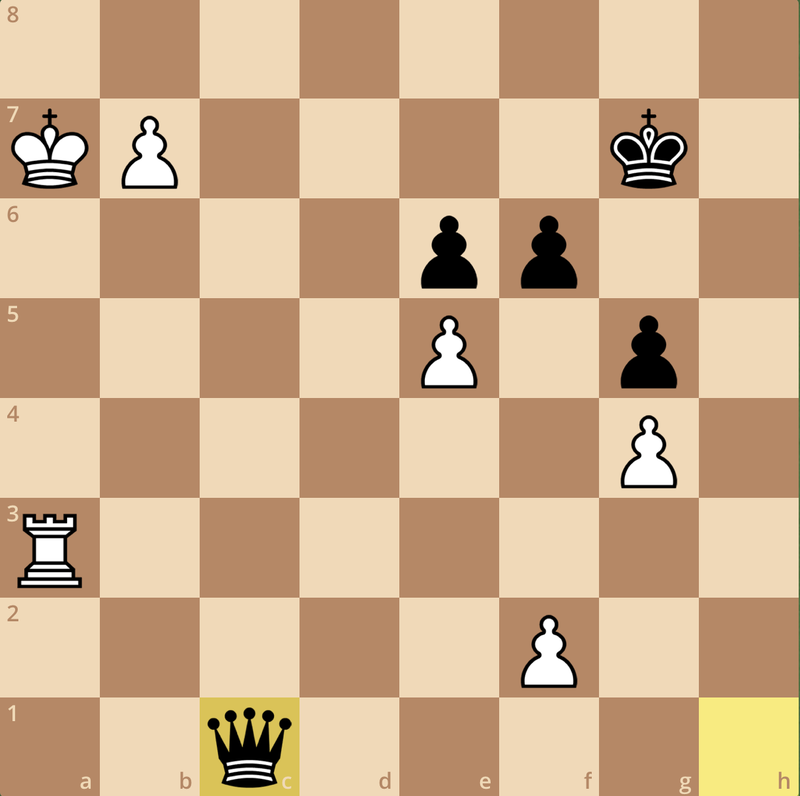 Rxe5 Qg7 but I couldn’t find a way for Black to keep the piece. “Okay, he hung it” but my opponent was a strong master, and such a mistake is so elementary… I went up and drank a glass of water and returned to the board to reanalyze my lines. Nothing. And so I continued. If I had just stuck to my plan of 29. Qd1! 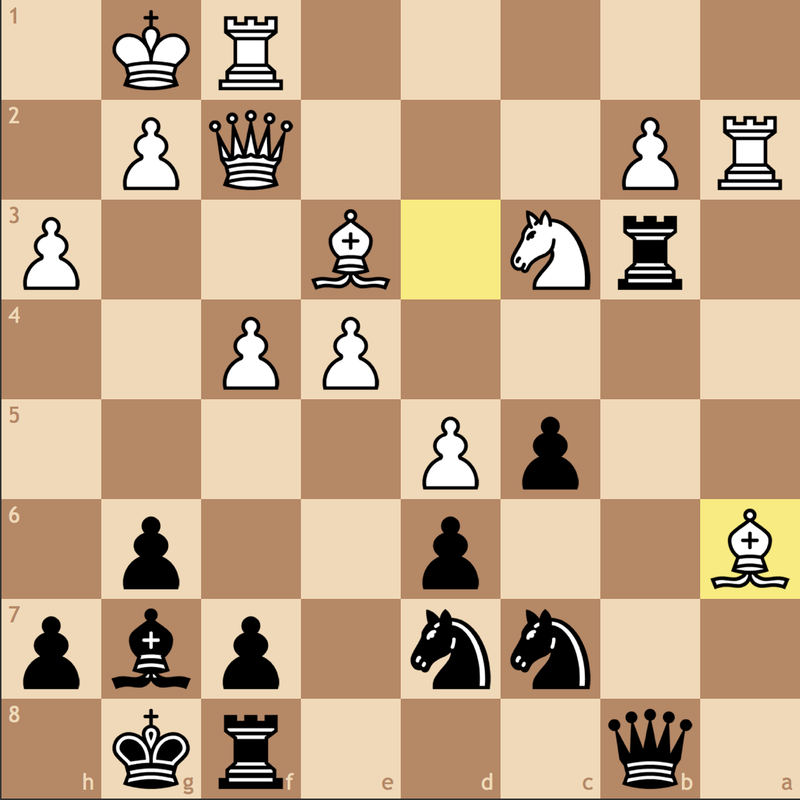 Black would have had to give up the exchange since the b3 rook and d6 bishop are hit. But I was greedy and continued 29.Bxe5 Bxe5 30.Rxe5 Qb8! 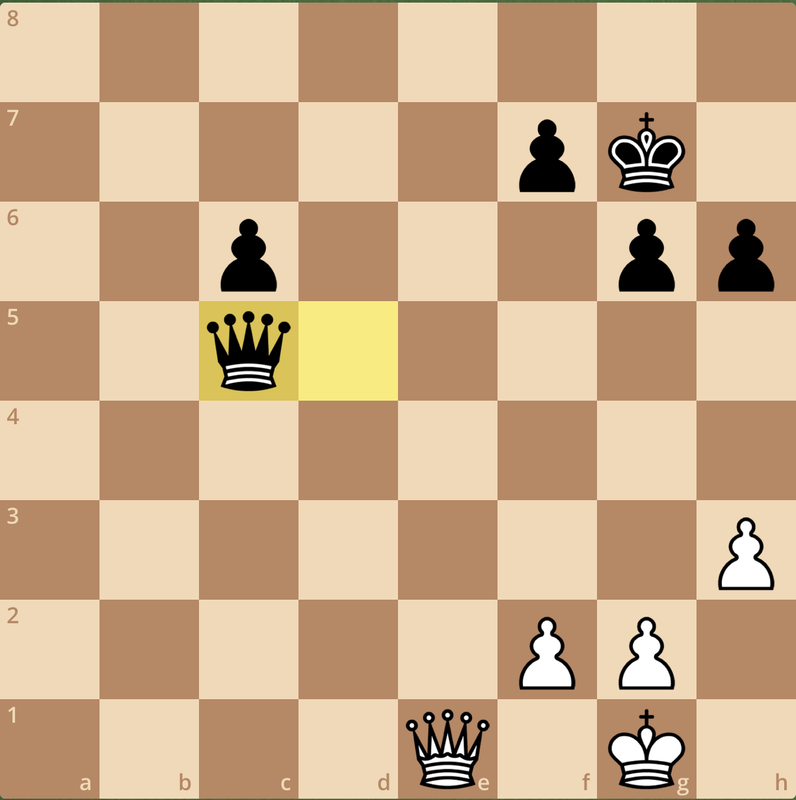 It was in this moment I realized I had forgotten one of the most basic rules of chess when I recaptured the rook on b1. My original intention was to take on d8, but of course, this isn’t legal due to the pin along the back rank. 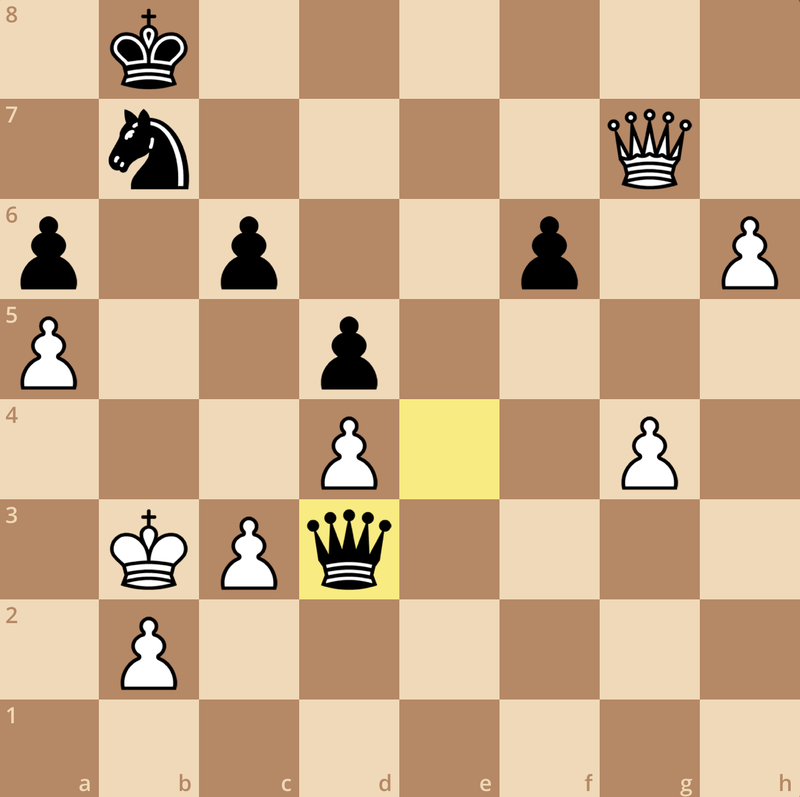 My opponent converted the endgame, but my position is practically resignable here. Obviously losing this game put a big dent in my tournament hopes, but I could still have an outside chance at winning so I wasn’t too worried yet. 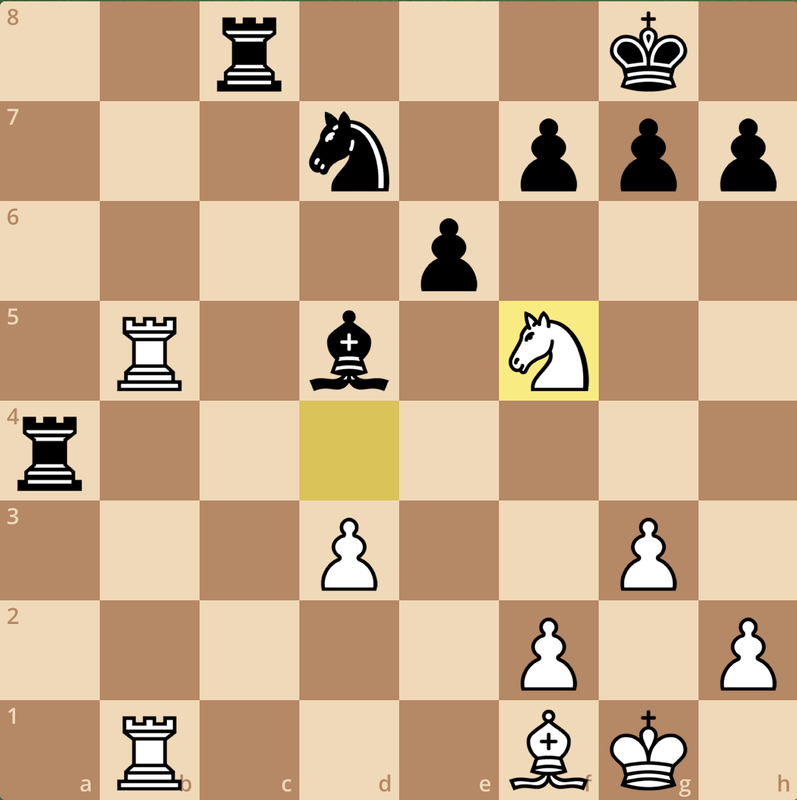 In the third round, I played a 1400-rated player who played unambitiously until his position was nearing critical condition, and then somehow riddled the best move in the position eight times in a row to reach equality. Right when I sobered up to the real possibility of drawing, my opponent hung mate, and I was spared of any humiliation. My bishop is passive for now, but this is the consequence of having had the worse side of equal. Now I want to trade off a pair of rooks or force Black off my back rank. 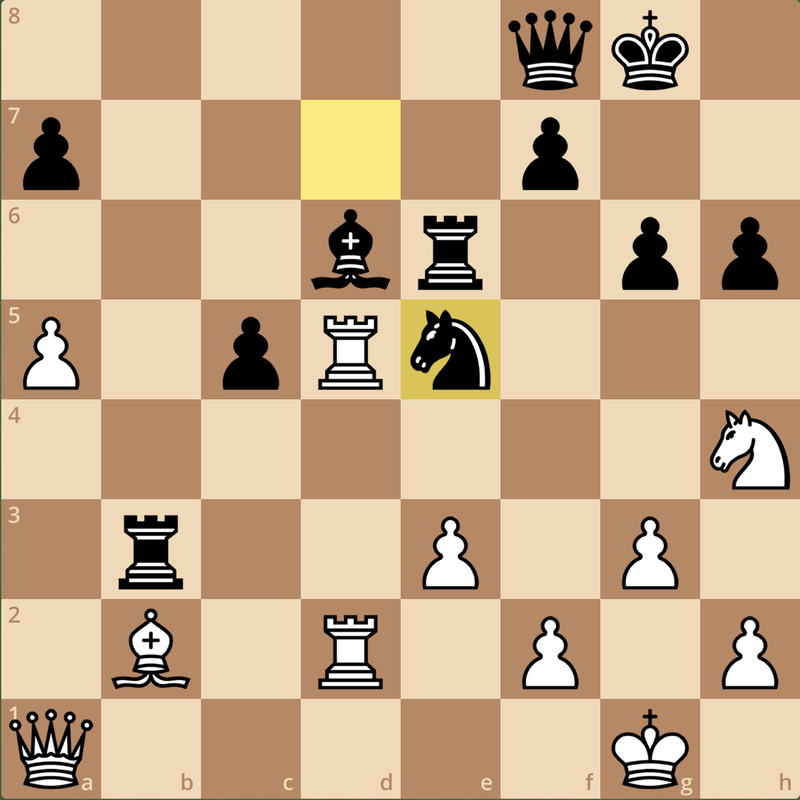 22…Nd7 23.Rcb5 Rc8 24.Rb1 Ra4 25.Nf5! 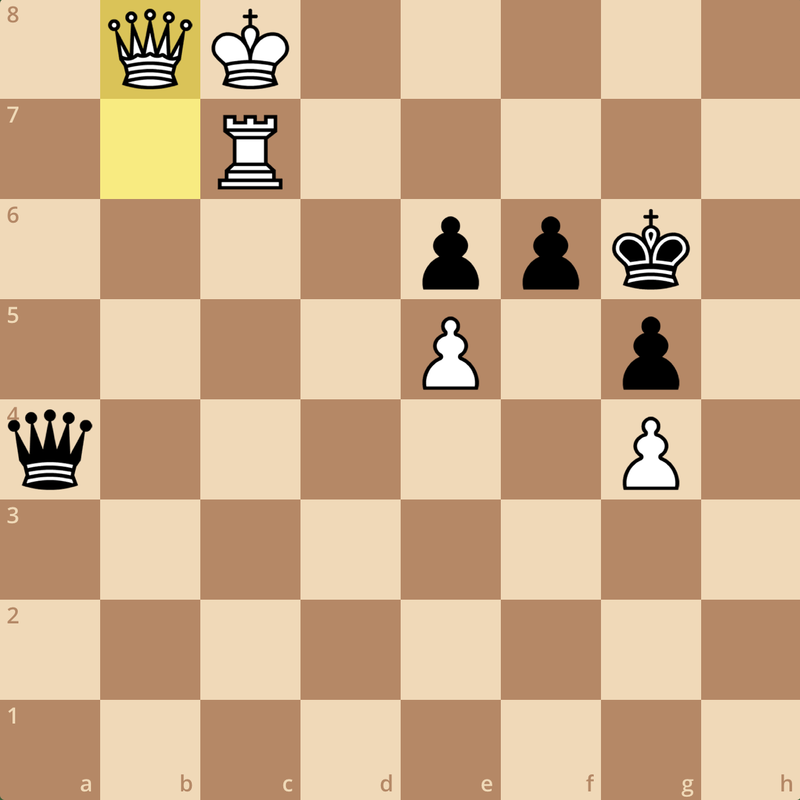 Also drawing was 34. h4, but there’s no reason to prove the 4v3 endgame if you don’t have too. My opponent played on for a few more moves, but soon realized how tenable my position was and agreed to a draw. It wasn’t quite the moment I wanted to demonstrate my defensive technique, but with the way the opening went, I had no choice in the matter. The timing of this round made my day plans quite weird. Having finished at half past three, I had the rest of the day to myself to explore New Orleans. Even though a draw meant I likely couldn’t win, I knew it was important to take a break from chess and relax. After putting my things back in the room, I got an Uber to get a ride to the French Quarter, but unfortunately, my driver asked me to cancel when he realized he wasn’t making as much as he thought he would for the drive. In doing so, it meant I couldn’t summon another Uber without paying a cancellation fee even though it wasn’t my fault. Grounded at the airport hotel, I didn’t exactly have much to do other than go on Netflix and watch some of the Copa America games. I was still feeling quite adventurous, so I ordered delivery from Domino’s and got their cheesy bread… Needless to say, I was quite disappointed. So as I’m sure you can imagine, I was looking forward to my fifth round game despite my overall tournament standing. Paired against an underrated youngster, we reached a same color bishop, queen, and rook ending, and once again my endgame knowledge proved vital. 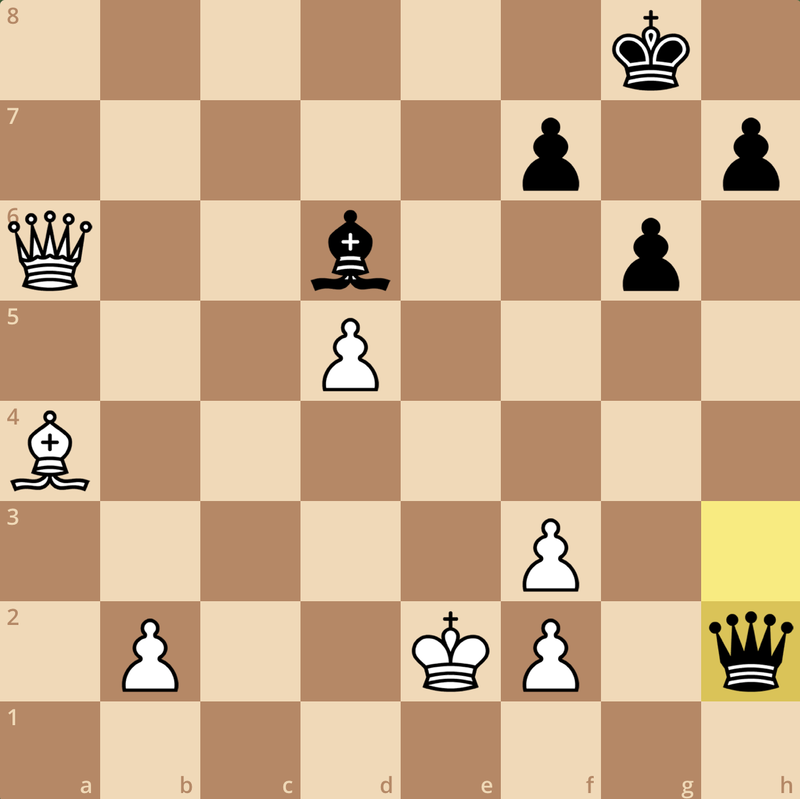 My opponent played on till mate, but I figure that that continuation is far less instructive. With a win, I sat at 3.5/5 and was tied for third heading into the last round. Though unrealistic, if my second round opponent were to have lost on board 1, and I had beaten my opponent on board 2, I would have tied for first, but I wasn’t counting on this. 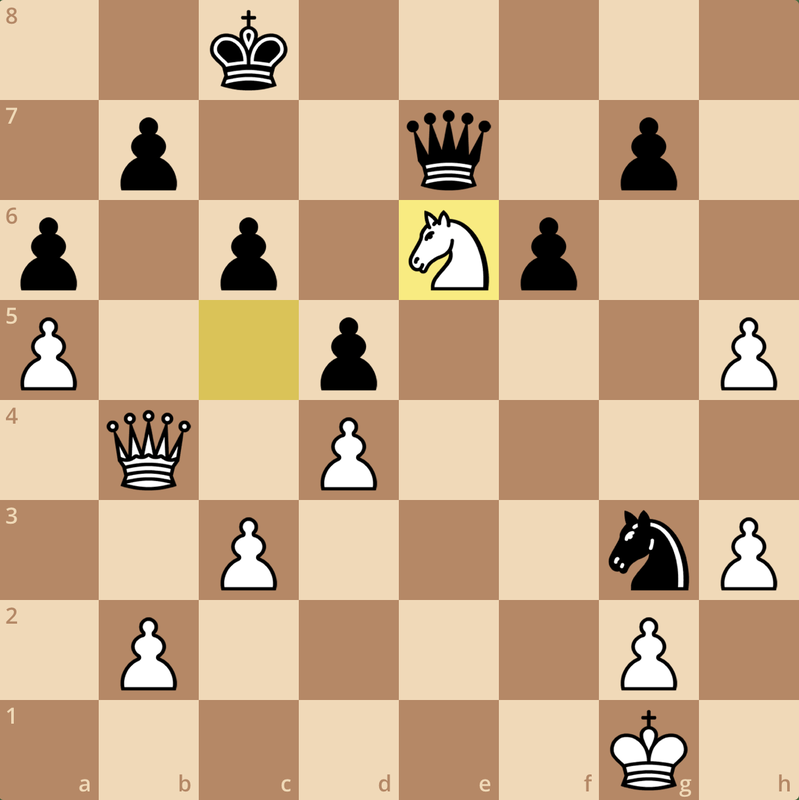 At this point, I recognized that if the tournament leader won with scholar’s mate, I couldn’t control it, and if he lost in four moves, it would still be out of my control. With my fourth round draw, I knew I was undeserving of first place, and if it happened then I would be extremely lucky. In just 30 minutes, the tournament leader drew, and that was that. As we’ve seen thus far activity has been the key theme in each of my endgames, and thus I played 28. Qe7?? Rf8 29. Qb4 Ne4! 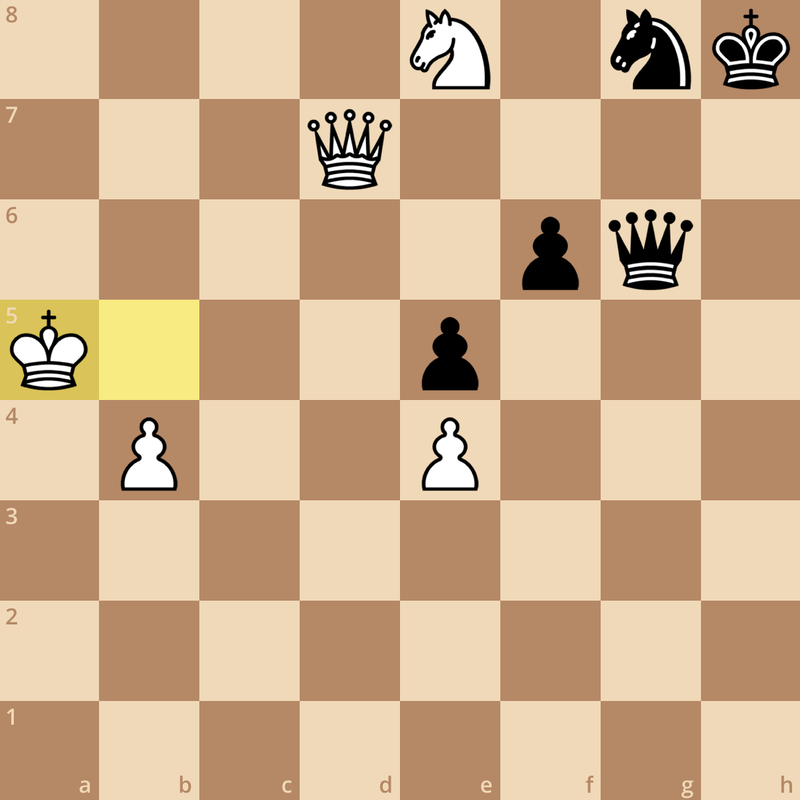 -+ Even though I pushed Black’s rook away, I neglected an even more important theme we had discussed, king safety! If I had found 28. 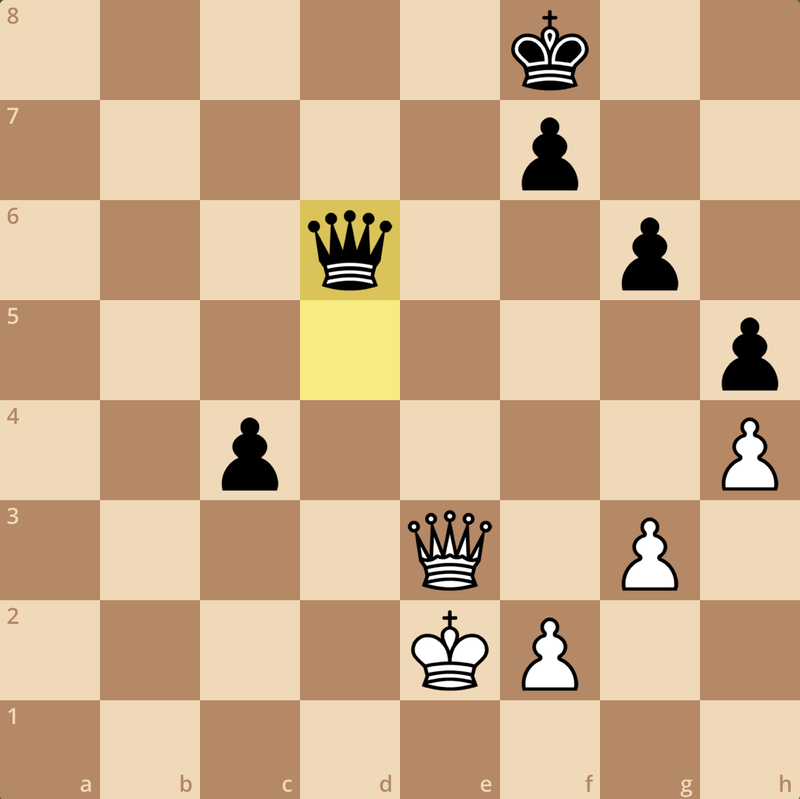 Qd3, my drawing chances would have sharply increased, and who knows, maybe I could have played spoiler and stopped my opponent from tying for first. This theme of consolidation is also extremely important in endgames, and admittedly it’s not one I spent extensive time studying back at home. So at 3.5/6, my tournament was over. I had my chances, but this weekend I was shown three reasons why I simply could not be the US Junior Open champion, and that’s okay. While I have my over the board regrets, I have no regrets about pushing myself to win this tournament. Training to be competitive has made me a lot more well rounded as a player, and has given me the discipline I needed to improve going forward. Again, I can’t stress how grateful I am to have competed in this event and shared my process to reach here with all of you. My last game completed, I was happy to find that Uber had waived my cancellation fee and even given me some credits for a ride. 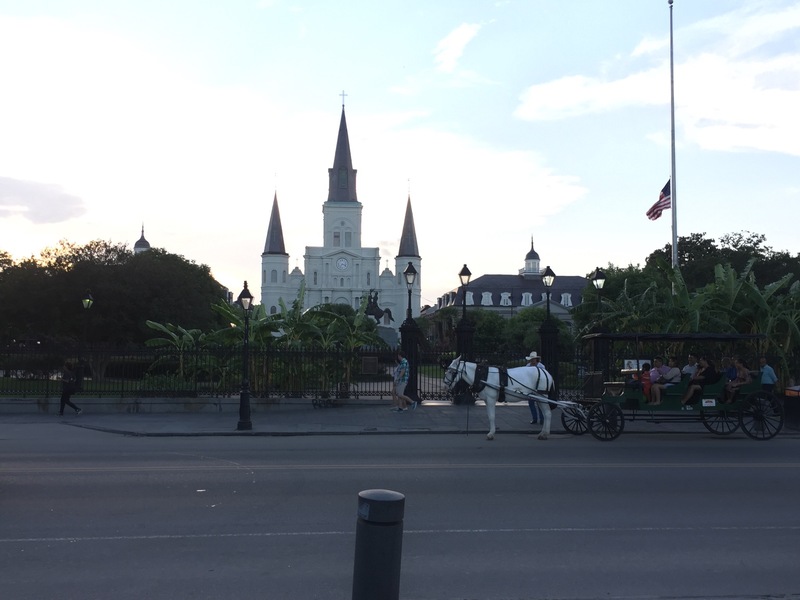 With nothing else to do, I finally got to head to the French Quarter and explore New Orleans. 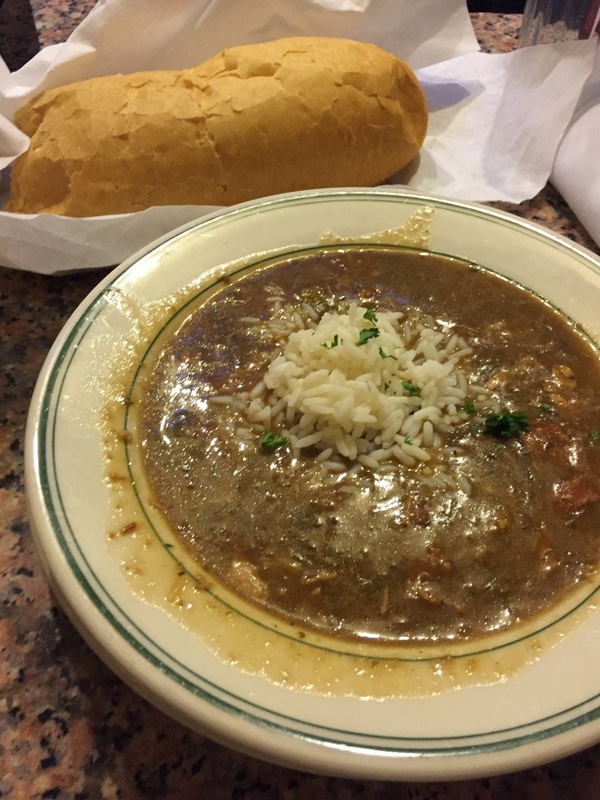 Being a food fanatic, I visited Cafe du Monde for their beignets and after a stroll through Woldenburg Park had dinner at The Gumbo Shop before heading back to the hotel. 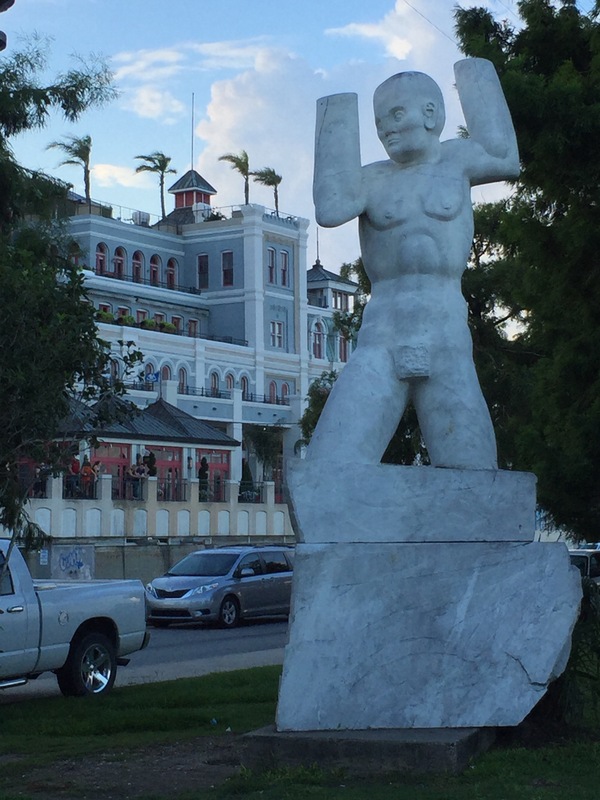 While I had fun exploring the city, I wish I had more time to visit famous attractions like the zoo or aquarium, but unfortunately, the location of the hotel made this just about impossible as nearly everything of interest was about a half hour away. With my last junior tournament in the books, I’ll have to think about what I want my next goal to be. Obviously, I want to become a National Master, but I’m hoping I can accomplish even more by the time I graduate college in three years… I guess we’ll have to see! 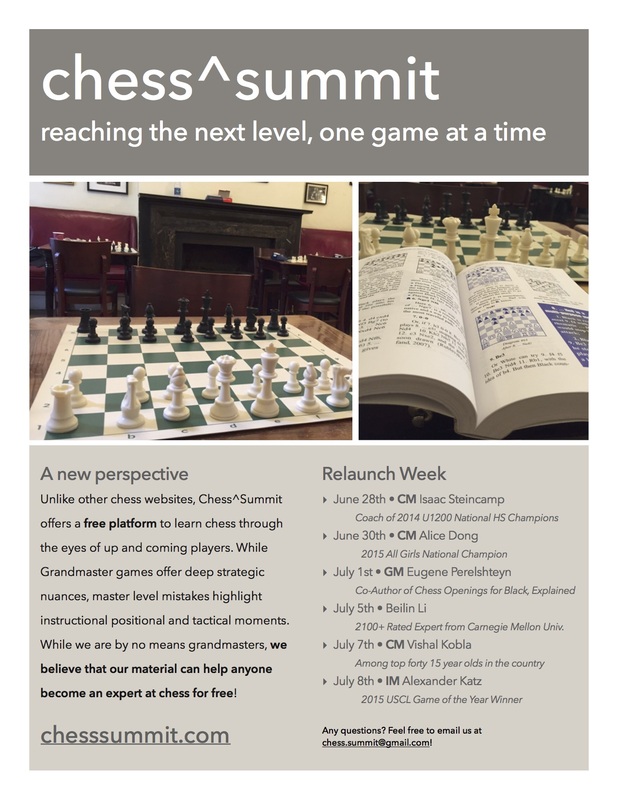 As I’ve mentioned before, I will be relaunching Chess^Summit on June 28th, adding three new authors in Beilin Li, Vishal Kobla, and Alice Dong. I’m really excited about the future of Chess^Summit, and I encourage you all to check out the new authors and learn from some of their own unique insights! See you all in a week! Nine months ago, I set the nearly impossible sounding goal of winning the US Junior Open in New Orleans. Back in September, I had yet to achieve the Candidate Master title, nor had I managed to answer other important questions like “what is my major?” or “how will I balance chess and taking classes?”. 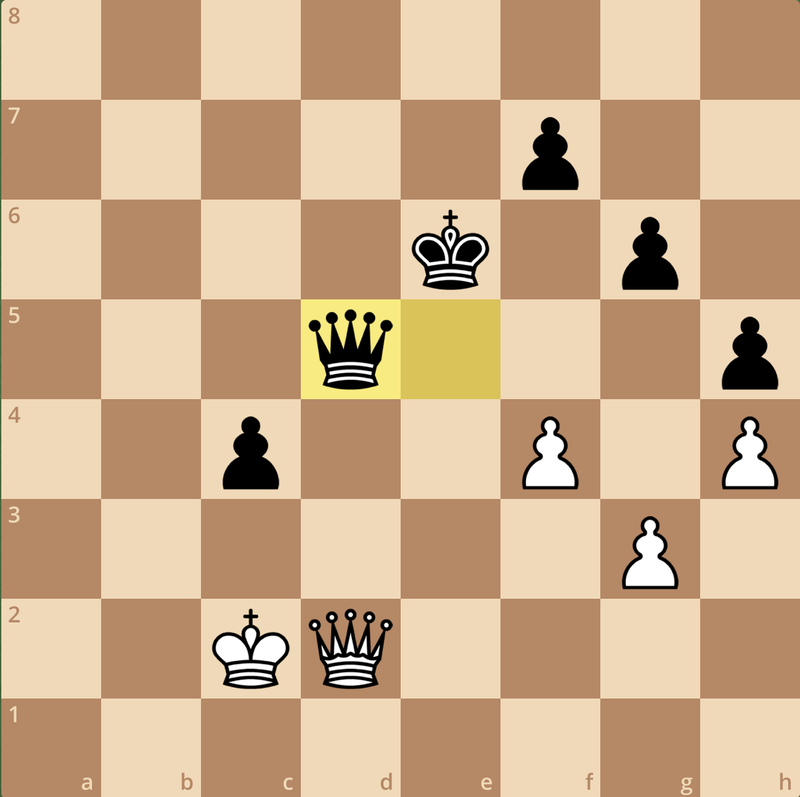 While I had yet to resolve my future, the response I received for putting my goal here on Chess^Summit was tremendous. Before I take off for New Orleans later this week, I wanted to thank everyone who pushed me towards my goal this year. Whether you contributed to my GoFundMe campaign, were a fan of my articles here, or just a friend interested in my various performances, your encouragement saw me compete in places like Philadelphia, Boston, New York (to name a few! 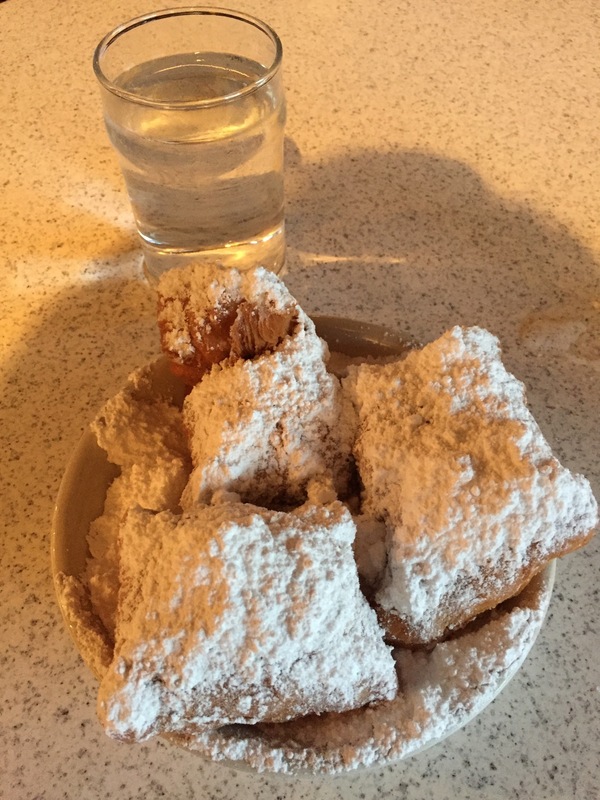 ), and now New Orleans. I’ve learned so much this year, and it would not have been possible without all of your support! While anyone who followed my performances this year played a role in my improvement, there are some individuals who, without whom, my goal would simply not be possible. First, I’d like to thank my coach, Grandmaster Eugene Perelshteyn, who planted the idea of winning the US Junior Open into my conscience. I’ve been working with Eugene for over two years, and if anything, he’s taught me how to become a stronger player, not necessarily by playing better, but by playing smarter. 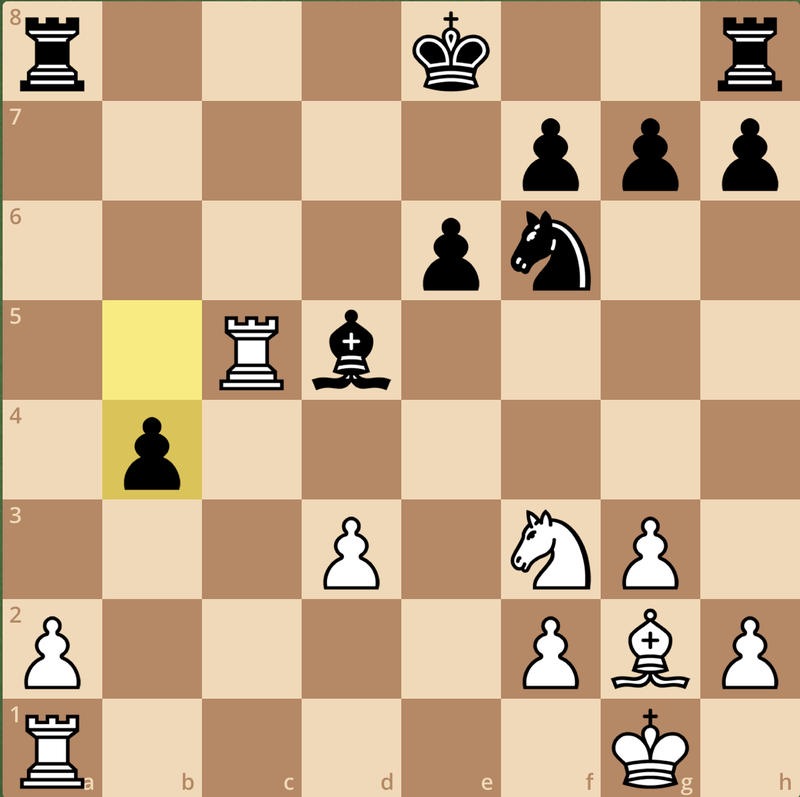 Since I’ve started working with him, his ability to break down a position has always made an impression on me, and it’s this same ability I try to replicate in my articles here on Chess^Summit. I’d also like to thank National Master Franklin Chen for also working with me this year, strengthening my opening play and preparing me for many tournaments. I’ve been a little quiet on discussing Franklin’s role in my improvement, mainly because I was worried that ambitious players in Pittsburgh would prepare for me differently if they knew I was working with him. In reflection, this is probably a testament to the work he’s done with me to make me a more aggressive player, and his overall knowledge of chess. Lastly, I’d like to thank my friends and family both here in Virginia, and in my new home at the University of Pittsburgh. 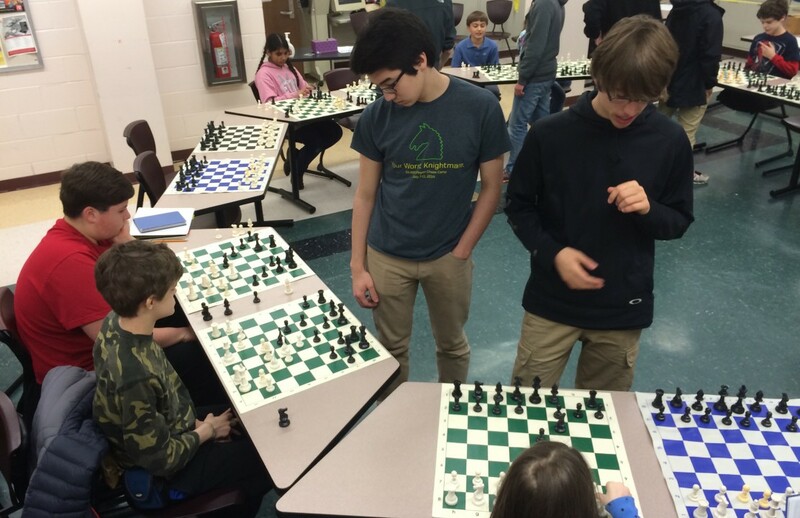 While they are by no means great chess players, their motivation and consistent encouragement provided a daily reminder to keep fighting and trying to improve. The influence they’ve had on my outlook of my performances has forced to become much more positive – and yes – realize there is a world outside chess whenever I have a bad performance. In this last post before I fly south, I can’t thank everyone enough for the support these last nine months. Since I’ve started this campaign, I’ve broken 2100, earned the title of Candidate Master, won my first adult tournament, and beaten three players rated over 2300, which has me believing I have what it takes to put together a championship performance this weekend in New Orleans. Regardless of how this weekend turns out, I’m extremely grateful for the opportunities I’ve had t0 compete and improve, and I’m sure the lessons I’ve learned these last nine months will last far beyond the US Junior Open. This ability to share my goals and progress is precisely the reason why in two weeks I’ll be relaunching Chess^Summit with other ambitious authors, and I hope you continue to follow us after the US Junior Open concludes. Once again, thank you all for playing a big role in my goal, and I hope to bring back good news next week! Endgame Essentials: Dramatic, not Drawmatic! If I’m totally honest, I don’t think I learned to fully appreciate rapid tournaments until this year. 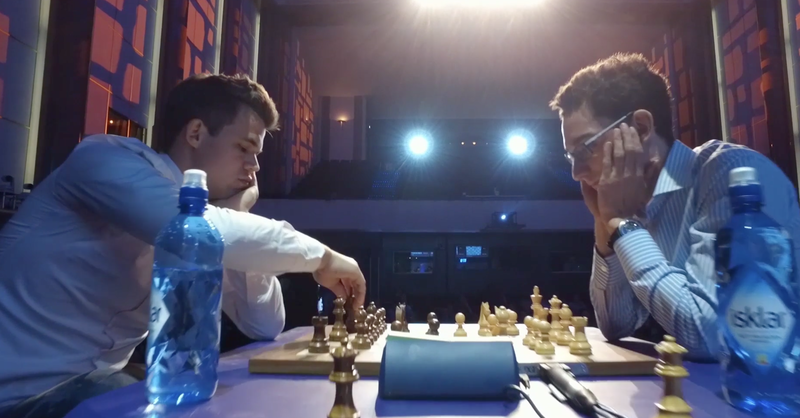 It took three tournaments to change my mind: the 2015 Chess World Cup, the Ultimate Blitz competition featuring Garry Kasparov, and today, the first leg of the Grand Chess Tour in Paris. Unlike longer time control games, rapid chess emphasizes strong, practical play, and takes the spotlight off of brilliant opening preparation. At this level of competition, winning implicitly requires two elements: accurate calculation and the ability to convert better endgames. 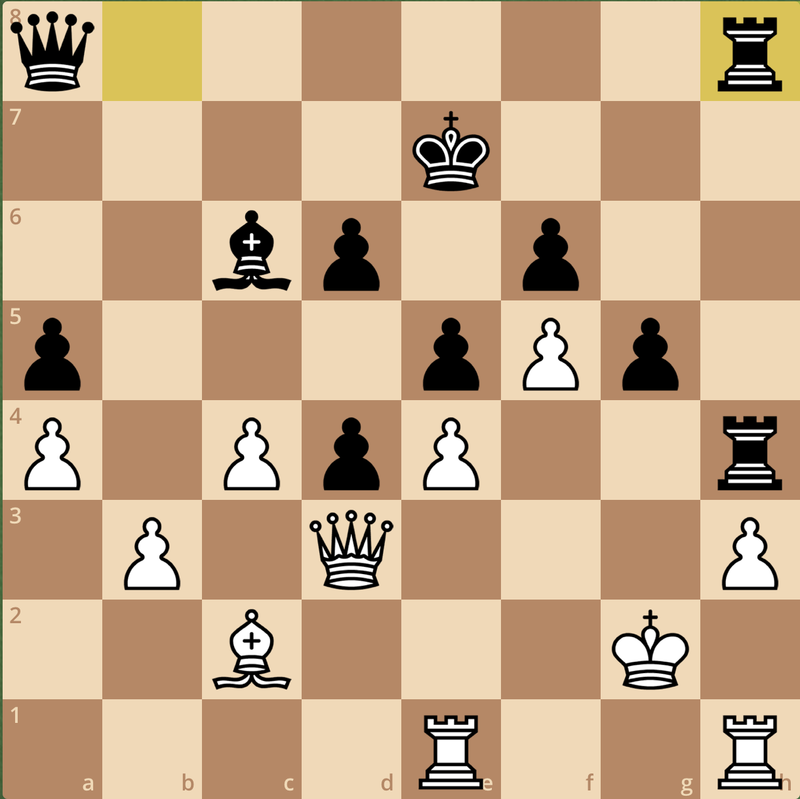 In the first day of competition alone, I found five endgames worth sharing and wanted to break down each of their critical moments in today’s critical endgame posts. Remember, as we move through each game, take a minute to assess the various defining features of the position: activity, solidarity, king safety, and ability to improve. For our first endgame, we start with the protagonist of the story thus far, Magnus Carlsen. While his Grand Chess Tour started with an eerily similar first round, it’s important to not overlook the accuracy he brought to this endgame against Wesley So’s particularly stingy defense. On face value, the position seems fairly equal. 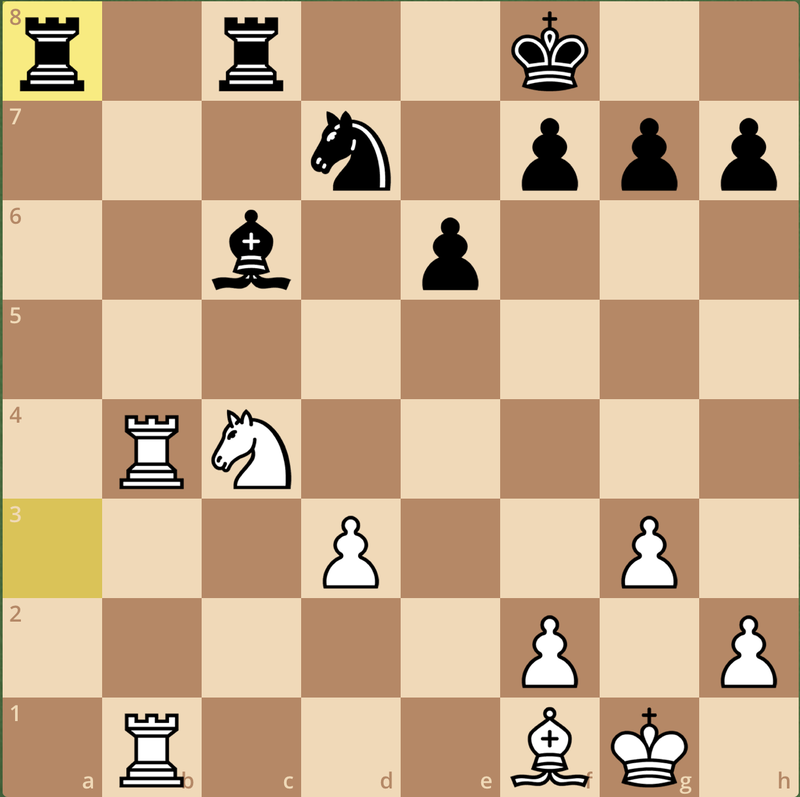 After trading rooks on e8, the position provides us with a symmetrical pawn structure and equal material. However, two elements stand in the way of the American achieving full equality. 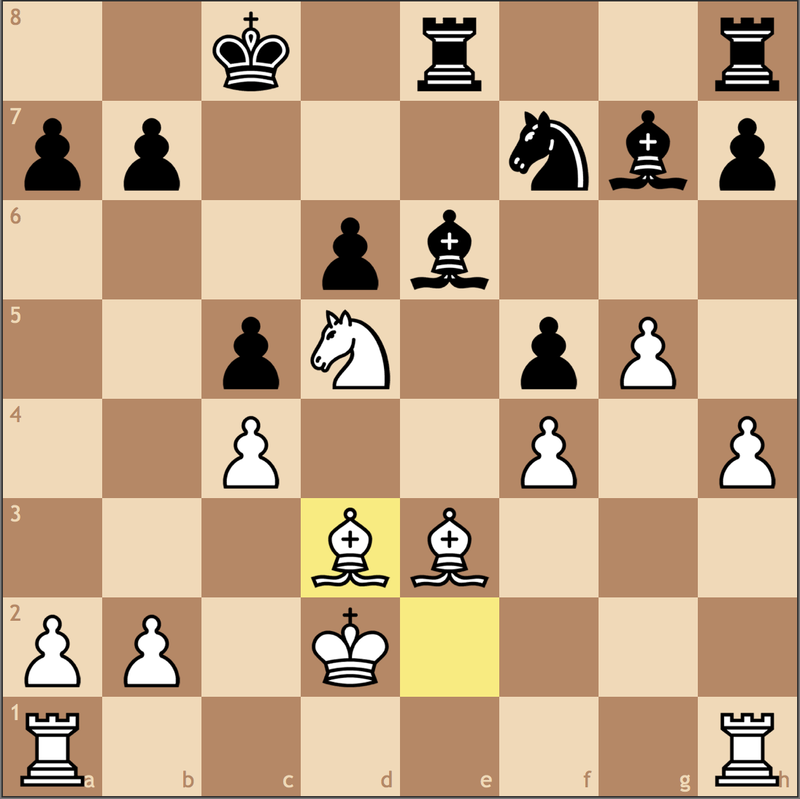 First, the bishop on a7 is dormant, pushed away from the action thanks to the bishop on g3 and the pawn on d4. 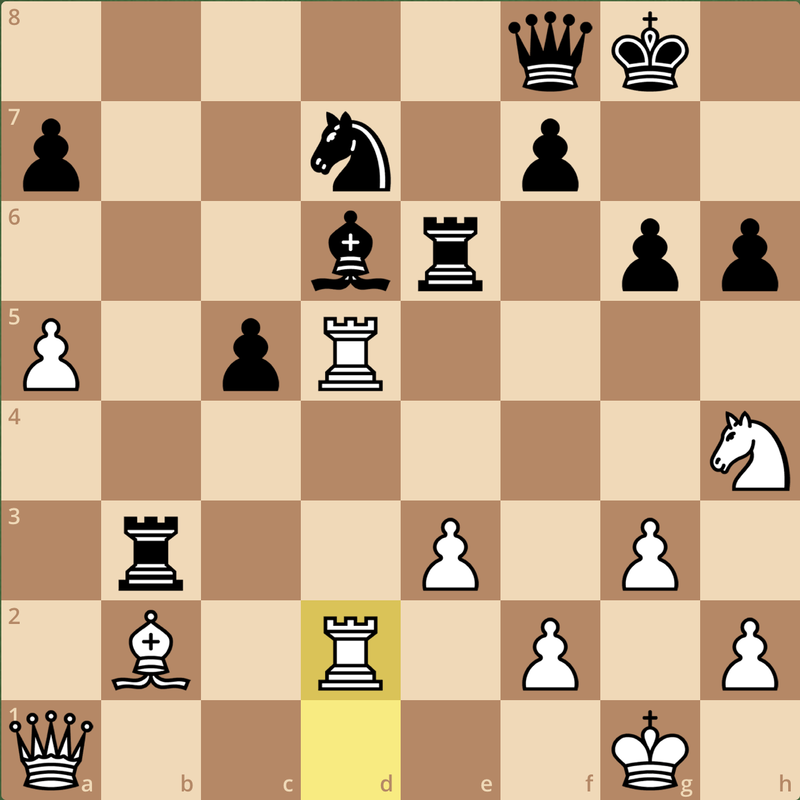 Furthermore, his pawn on b7 is backward, and can easily become a target should White move his knight to c5 in the future. Black’s plan here is to march his king to c8 to cover b7 and prepare …Ba7-b8, and with only one real structural weakness in the position, should have enough to hold a draw. Magnus can’t really do too much to stop this idea, so he makes the most of his turn with his next move, 27. a4! Wesley may be moving backward, but he still boasts a solid defense. As long as he has only one weakness, it will be very difficult for Magnus to make progress. 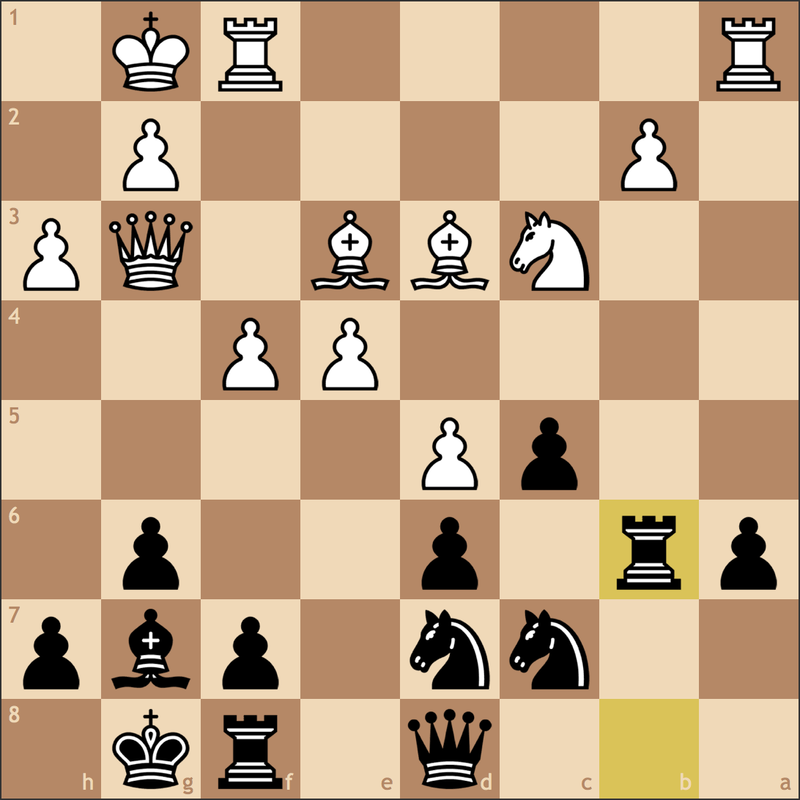 In the next “phase” So executes the dark-squared bishop, and the f4 knight finds the c5 square. 34. Kg1 Bb8 35. Nd3 Bxg3 36. fxg3 Nf5 37. g4 Ng3 38. Nc5 Again, the game is relatively equal, and Wesley has put up the toughest defense we’ve seen in this series thus far. 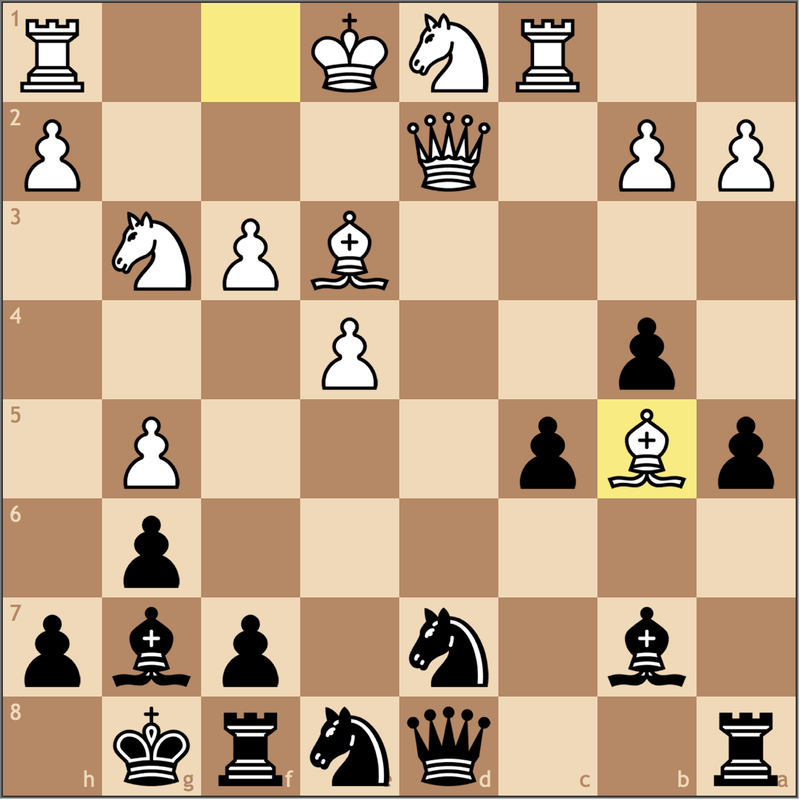 White counterintuitively doubled his pawns, giving the Black knight targets from f5. While I appreciate the idea of compactness, I think this structural decision made life for Magnus a little more complicated. Instead of 34. Kg1, perhaps he could have considered other prophylactic resources, but in this position, he’s still doing fine. White now has the pressure he wants on b7, but the problem now is that his pawn structure closes his army off from the kingside, giving Wesley the break 38…h5 39. gxh5 and the natural 39…Qe7. But as it turns out, this gives Magnus a tactical opportunity in 40. Ne6!. These moves are hard to find in rapid play, so I can’t really blame Carlsen for the miss. Anyways, this move would have been an amazing find. 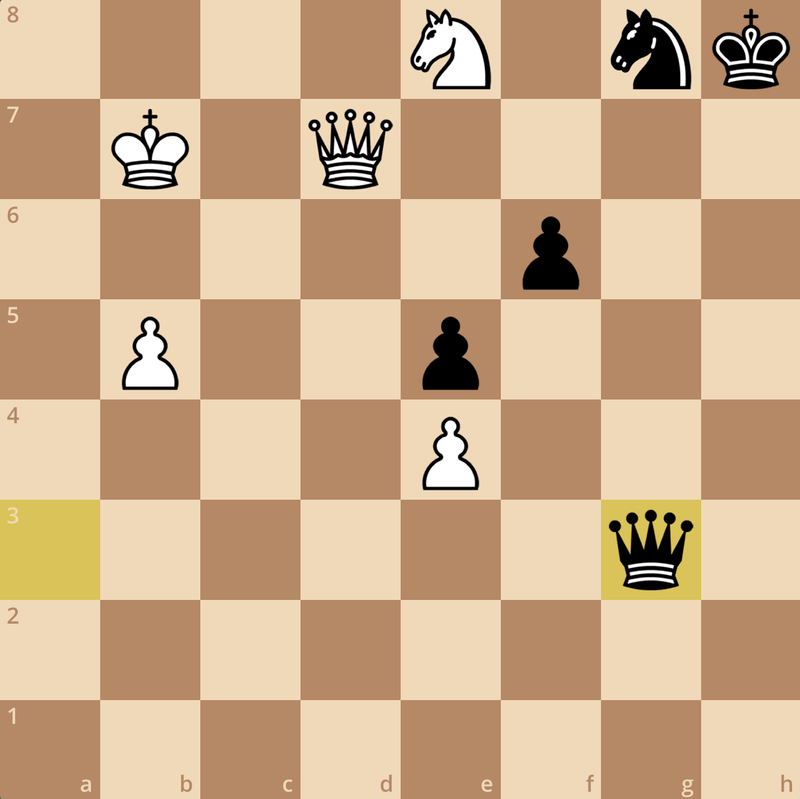 By revealing a discovered attack on the queen, Black’s options are limited. Already we can see that 40…Qxe6 41. Qf8+ Kd7 42. 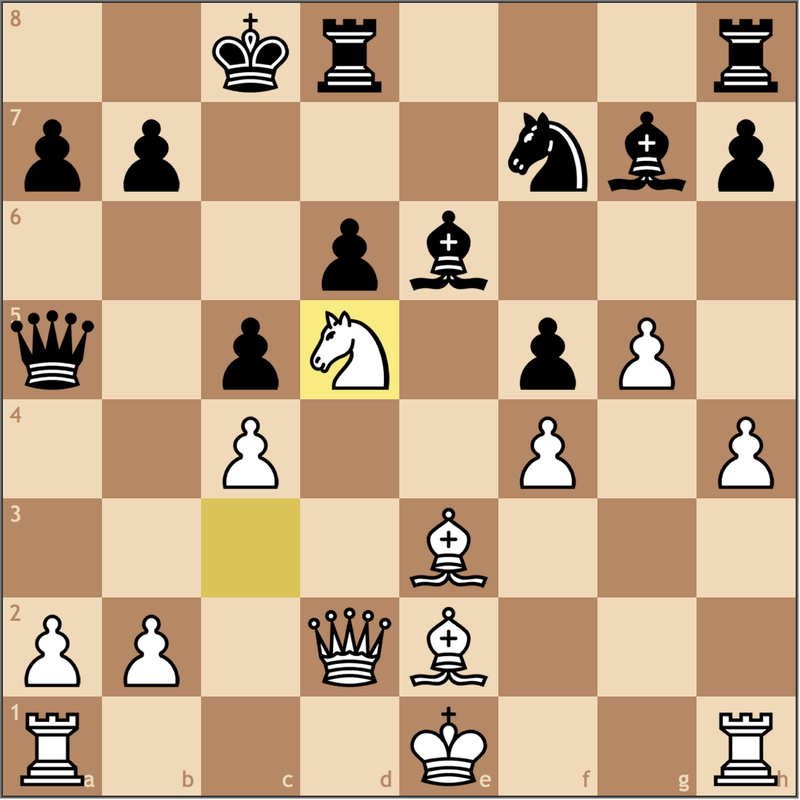 Qxg7+ will win back the knight back and retain a healthy pawn advantage. More critical was 40… Ne2+ 41. Kf2 Qxe6 41. Qf8+ Kd7 42. 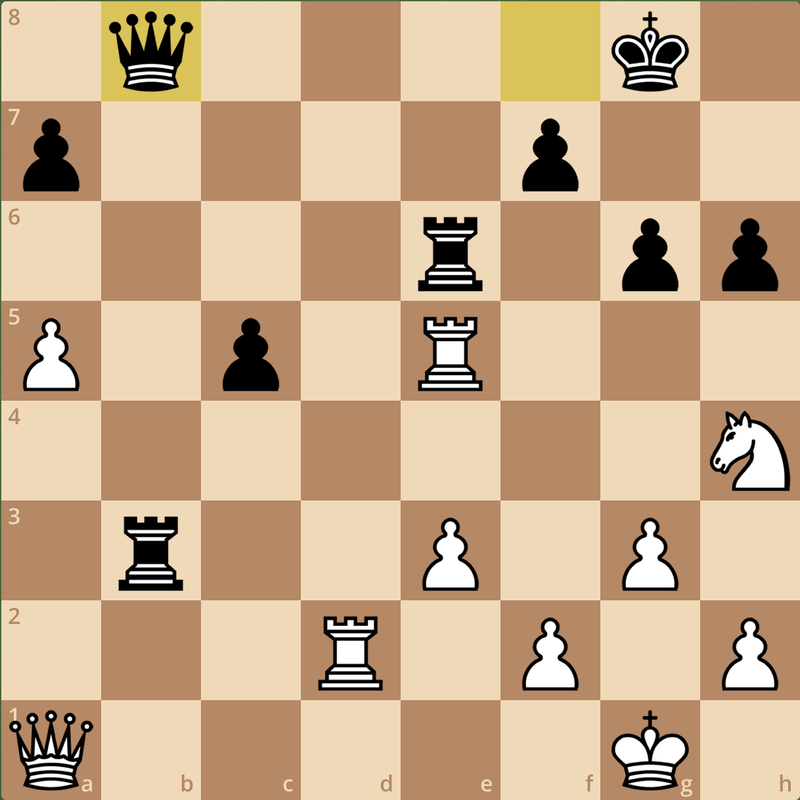 Qxg7+ where White doesn’t pick up the knight, but the h-pawn is simply unstoppable (see diagram). Position after 42. 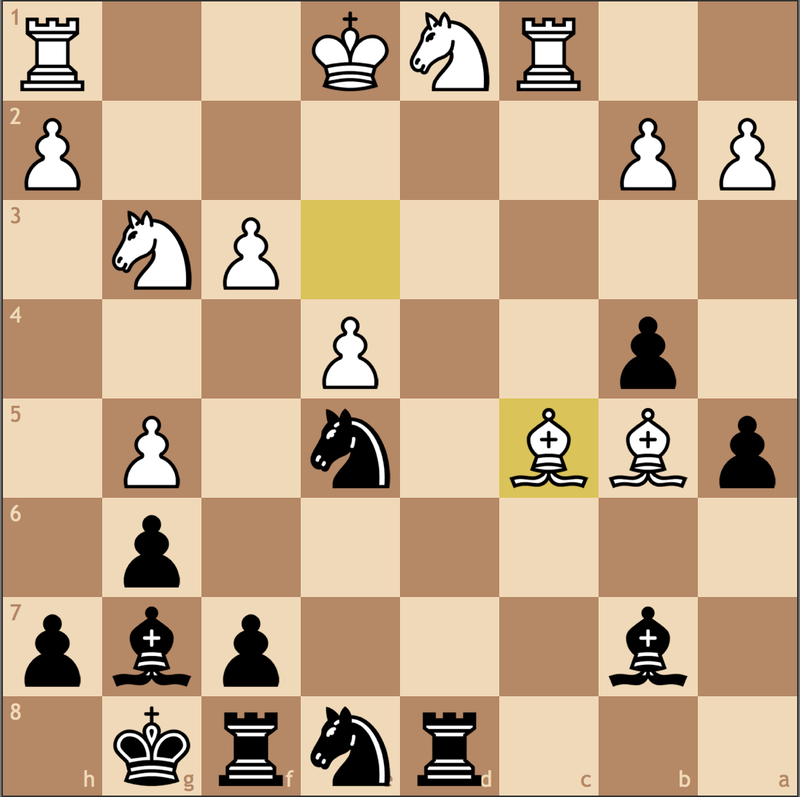 Qxg7+, Black is powerless to stop the h-pawn and must return material. 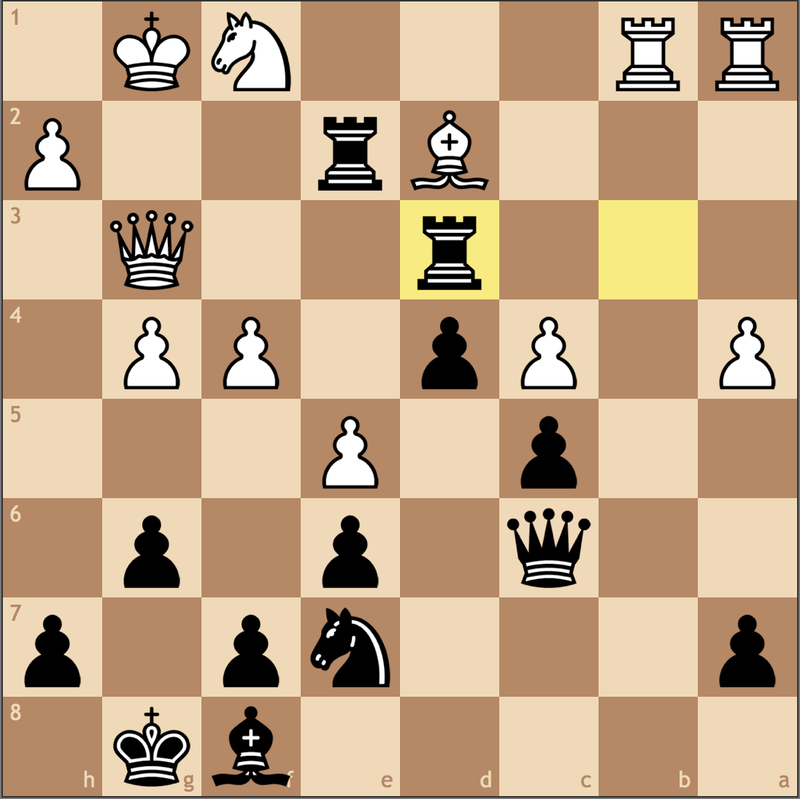 Black can consider 40… Qxb4, but the knight and pawn endgame is worse for Black after 41. cxb4 Nxh5 42. g4 Ng3 43. Kf2! 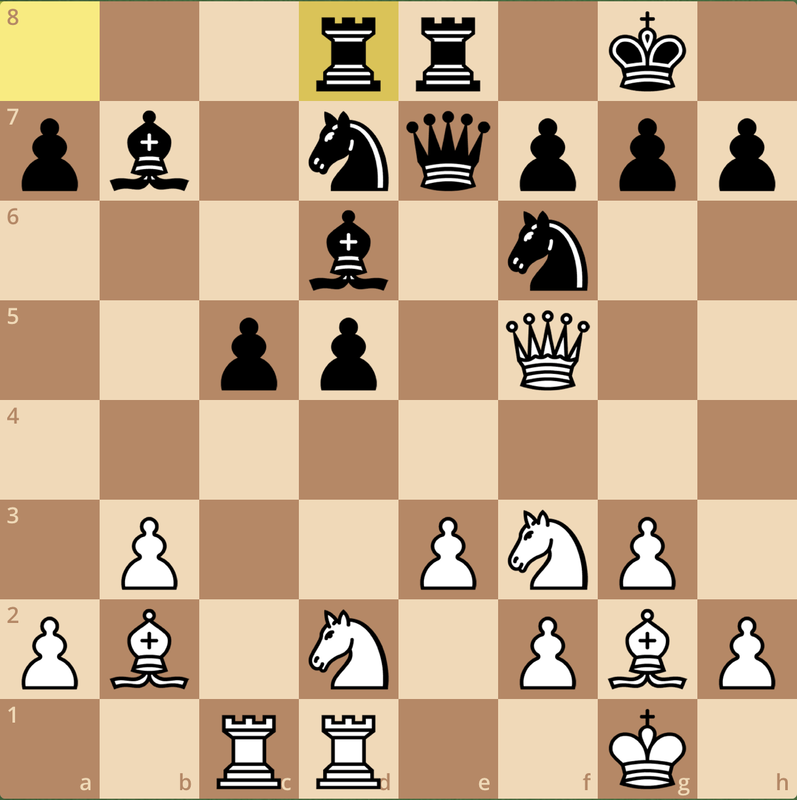 stopping the fork on e2, and once the g7 pawn falls, White’s h-pawn becomes a headache. That being said, these moves are really unnatural but I like how it highlights flaws in Black’s position. Black has two concrete weaknesses, b7 and g7, and the task of covering both of them is extremely difficult if White plays the best moves. Instead, Carlsen chose 40. Kf2 and the game continued. 40…Nf5 41. g4 Qe3+ and equality was temporarily reached. 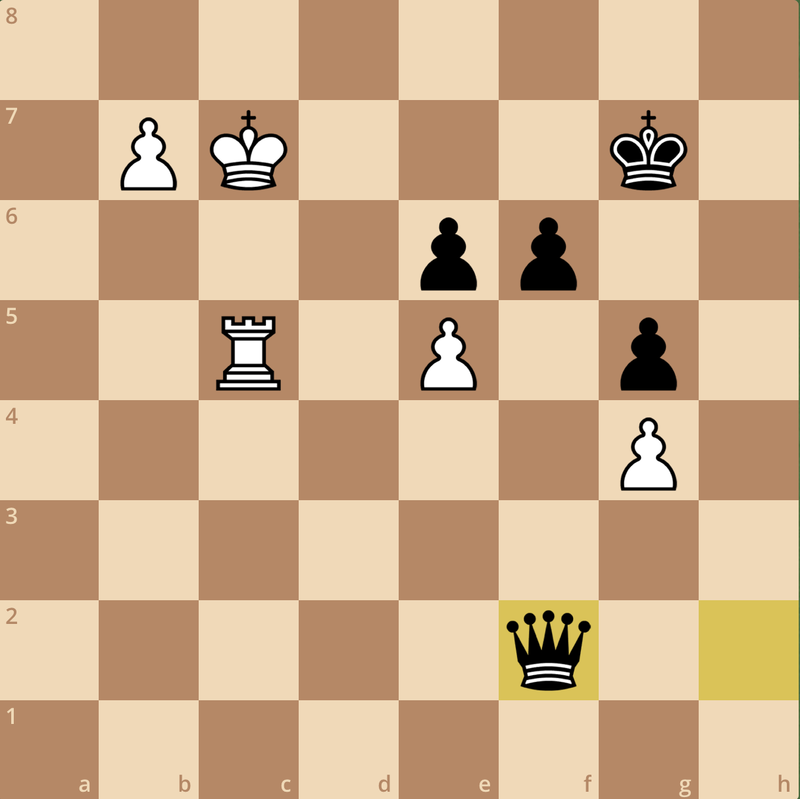 The position is in the balance, but can Wesley make the correct net to force perpetual before the h-pawn promotes? With no more checks in the position, Wesley moves his king away from a future check. 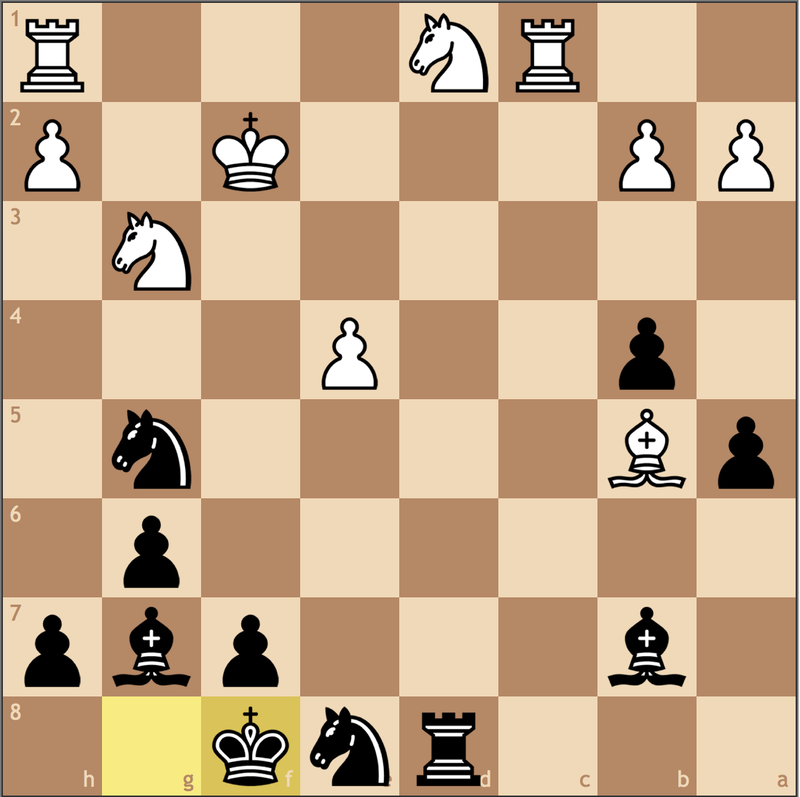 Both players were in severe time trouble, but it was still a surprise when the game suddenly concluded after 58. h8=Q Qa1 0-1 and it was Black who had won, not White (see diagram)! 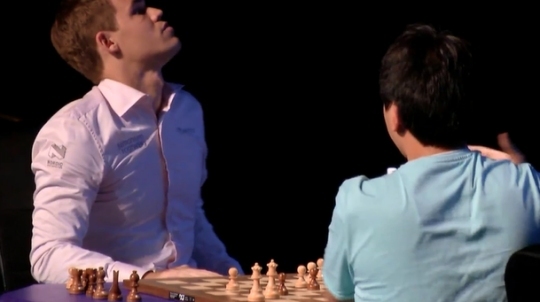 With about twenty seconds left (not to mention a ten-second increment), Carlsen found himself stuck between 59. Qxb7+ and 59. Qh2, both of which were completely winning. In a moment of curiosity, Carlsen decided to look at Qh8-h2 into more depth, and completely forgot about the clock, letting his time reach zero! Despite the drama, the reigning World Champion played a great game, pushing Wesley each move to find the best moves. So, of course, played solidly as well, but as we’ve seen so many times this series, one mistake in the endgame can quite often be unforgivable. Accuracy counts, and at the end of the day, it’s what goes on the scoresheet. Our next three examples all occurred in the third round, and each provided instructive moments. 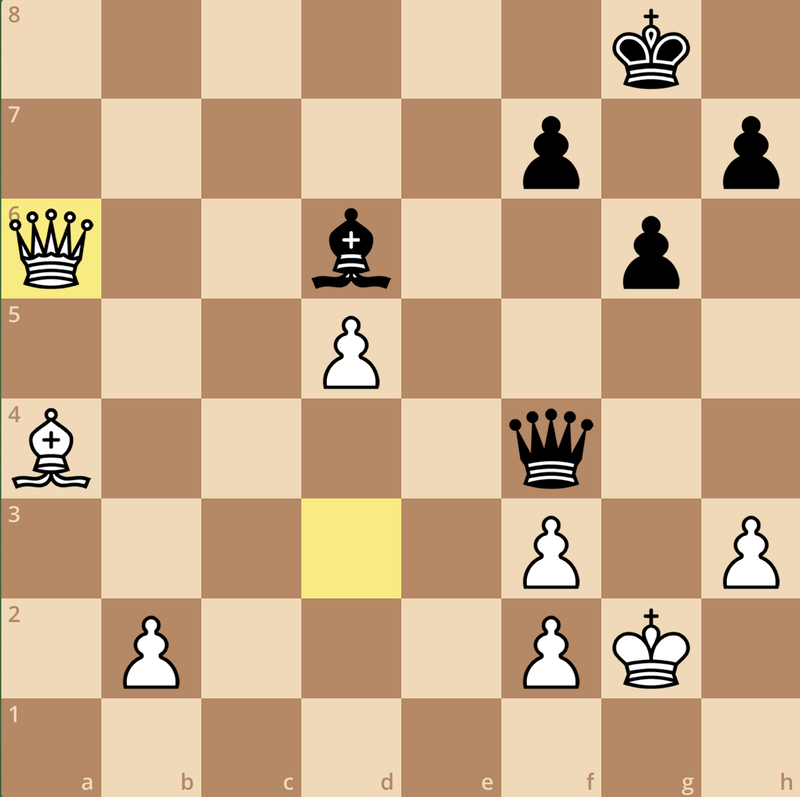 White cannot hope to promote the pawn and keep his material advantage. Again, accuracy is the critical difference between winning and drawing. Having proven himself to be a very capable escape artist, Wesley So once again found himself in trouble against Maxime Vachier-Lagrave. Unlike his lucky break against Magnus, he failed to find any miracles and lost this pawn down queen ending. Here Maxime has made a little bit of progress, but now he must figure out how to make his king more active. After, 47. Qc3 Qc5 48. Qe3 Qd5 49. Qd2 Qe5+ 50. 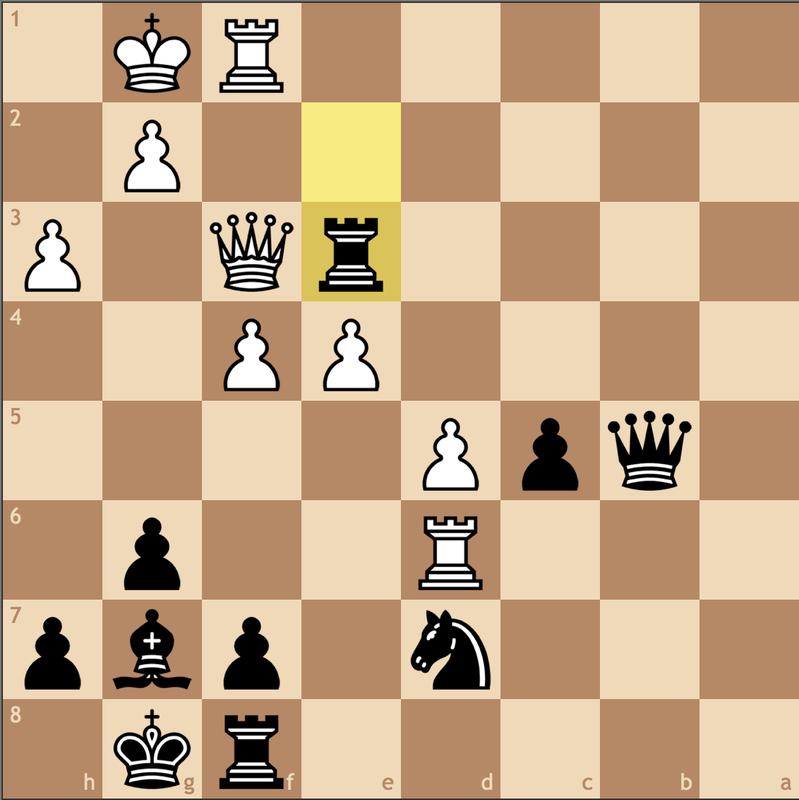 Kd1, it turns out that Wesley can do little to stop the advancing Black monarch. 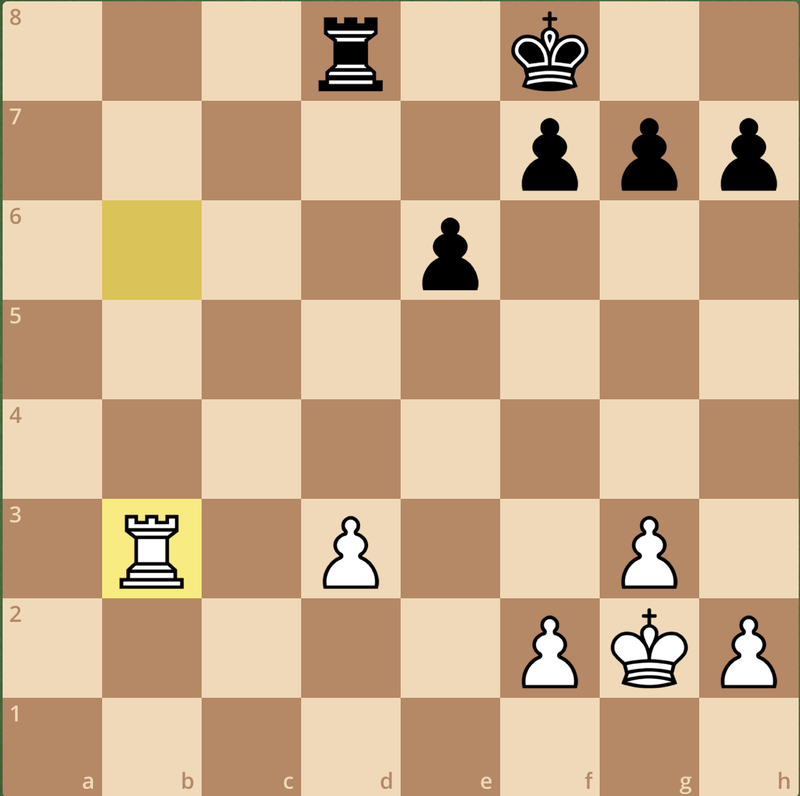 Perhaps at the expert level, White can hope to play on, but this endgame is lost. 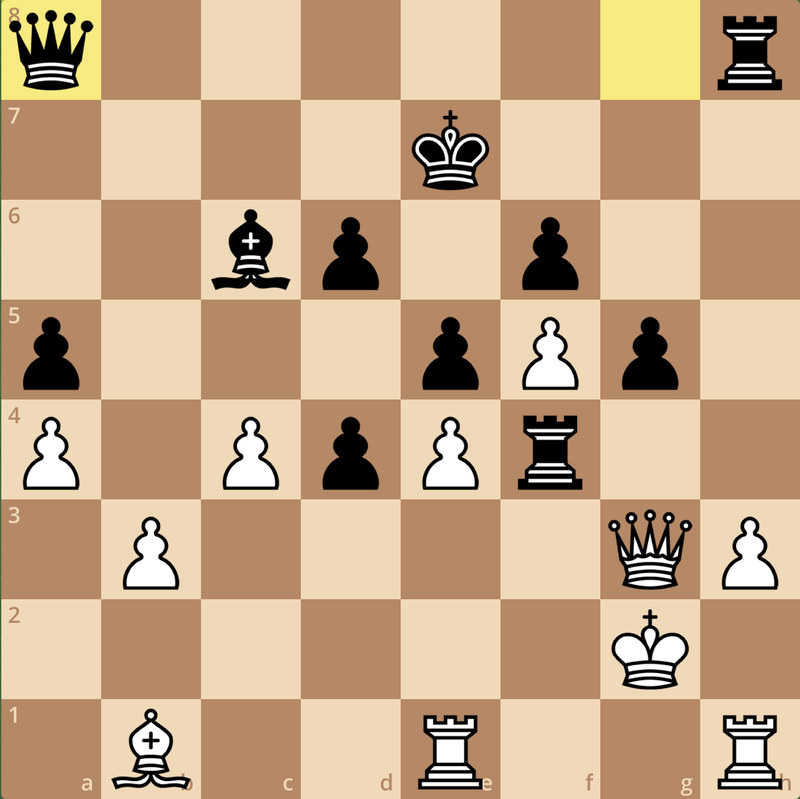 Black’s king will waltz to g4 and pick up all of White’s kingside pawns, and White can’t stop all of Black’s pawns. Wesley resigned, leaving us one more great endgame from the round. With a little help from the computer, GM Eric Hansen had a nice find here in 29…Qa1!, which should draw after 30. Qc5 Qa7 31. Qb5 Qa1 with repetition. The real idea is that 30. Qxb7 Qxc3 31. Qxc7 at least offers Black a lot of activity and decent drawing chances. 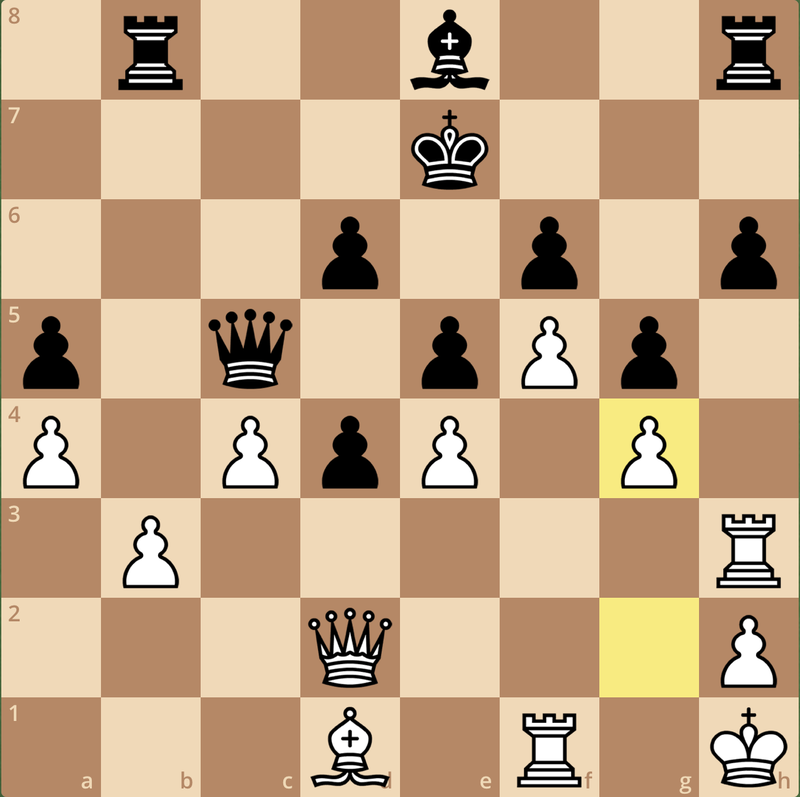 But of course, Stockfish doesn’t play for us in tournaments, and the natural 29…Qa8 was played, giving White a nice edge since his pieces can be activated faster than Black’s. Skip ahead a few moves, and Black found himself completely paralyzed. With no complications to offer, Aronian threw in the towel here, as both the b- and f-pawns are preparing to promote and sink the ship that is Black’s position. With a win here, Magnus won a second straight, proving he was completely unfazed by his surprising first round “defeat”. In his three-game winning streak, Magnus proved he was still the player to beat, having dominated each of the four opponents he had played up to that point. For our fifth and final endgame, I wanted to share a nice idea found by the commentary team that shows a benefit of the opposite-colored bishop ending. 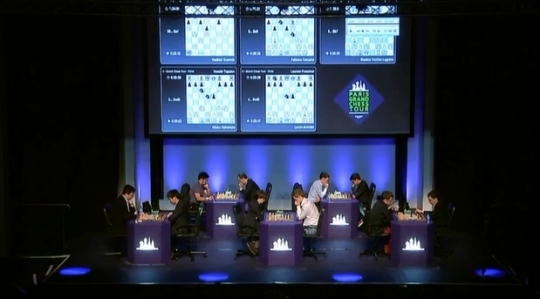 In this fifth round encounter, an early slip from Magnus gave Hikaru Nakamura an opportunity to press before cashing in on a draw. 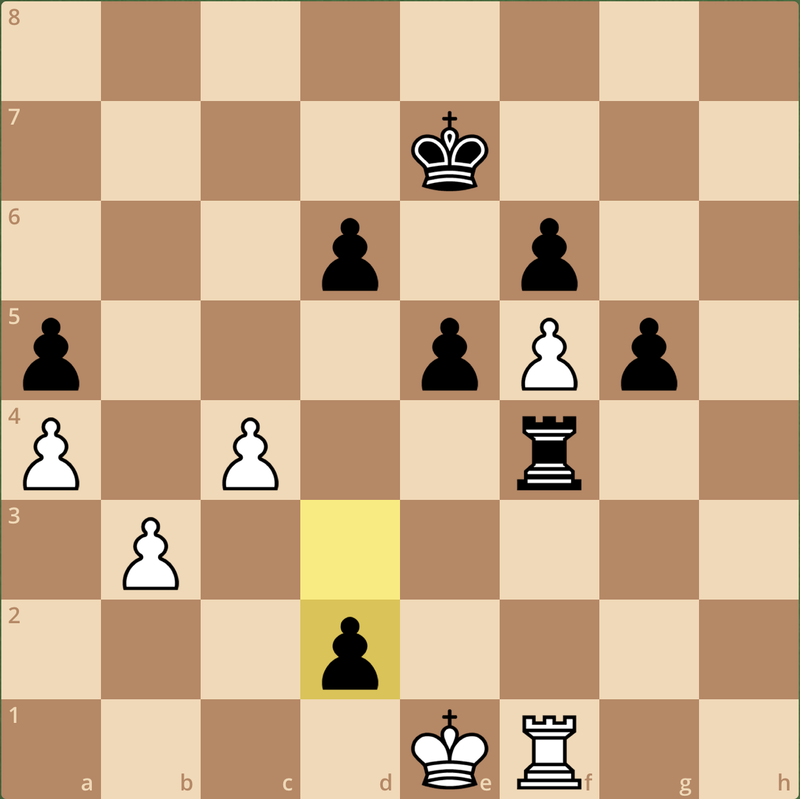 While the engines do agree that the position has relative equality, from a more human point of view, Black had a nice geometrical idea to press even further. 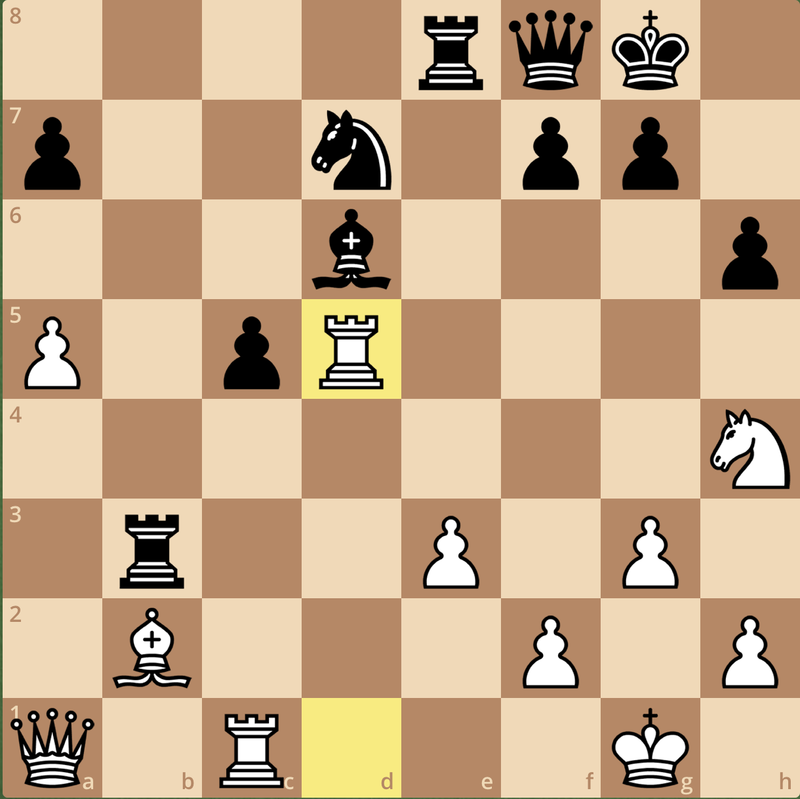 In this position, White has an extra pawn but the queen and bishop battery actually stop each of White’s pawns from making progress (b8, d6, and f4 are all covered, so promotion is not a threat from White. 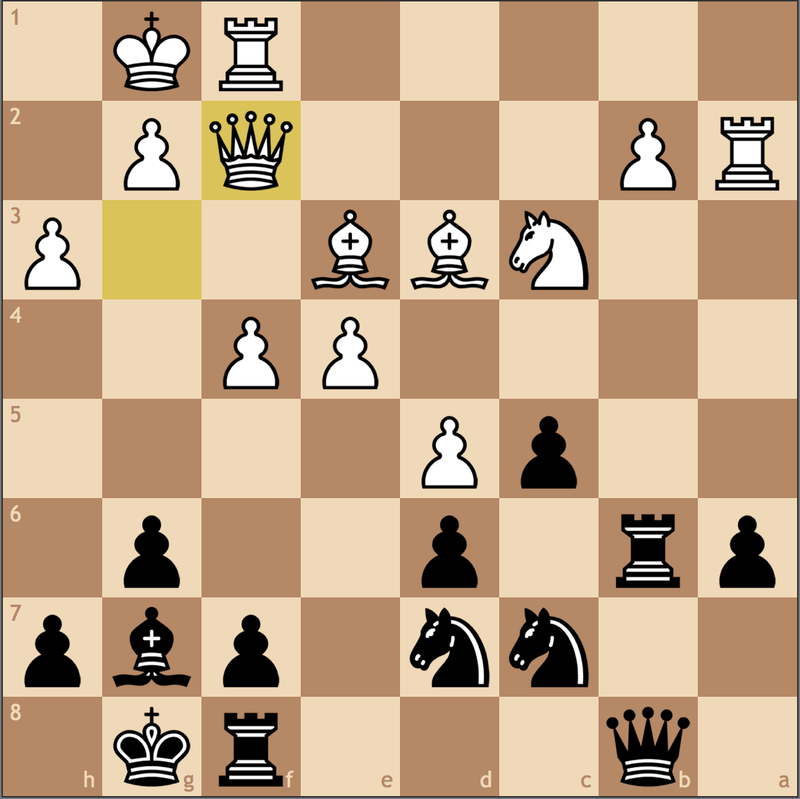 Black would put his queen on f4 to overprotect f7, followed by pushing the h-pawn. Nakamura would still have a lot to prove, but it’s clear he has nothing to lose. Wow, what a day! I suspect tomorrow has even greater games in store, featuring a Carlsen–Kramnik clash, as well as Caruana–Nakamura. With the way he’s been playing, I suspect Magnus to hold his lead after four rounds tomorrow, and it will be interesting to see if Nakamura can keep up! This weekend marked my last preparatory tournament before the US Junior Open – the inaugural Carolinas Classic. Given how my fast start to the Cherry Blossom Classic only petered out to a 3/7 finish, I decided to just focus on being consistent in playing each round. While arguably I failed in this respect, I did well to start 2.5/4 and get an opportunity to play for a class prize before dropping the final round and falling back to an even score. Unlike last week, the venue for the Carolinas Classic was right on the Boardwalk, meaning I had plenty of food options in walking distance. This tournament was particularly interesting for me, as I got to play new openings and reach sharp positions in three of my five games. While my debut in North Carolina saw an end to my nine-game unbeaten streak with Black, it also saw me to another win over a 2300+ rated player, as well as an encounter with the 2012 US Junior Open winner. Before we delve into some of the critical moments of my games, I thought I would share some of my thoughts on the first edition of this FIDE rated event. The tournament hall before Friday night. 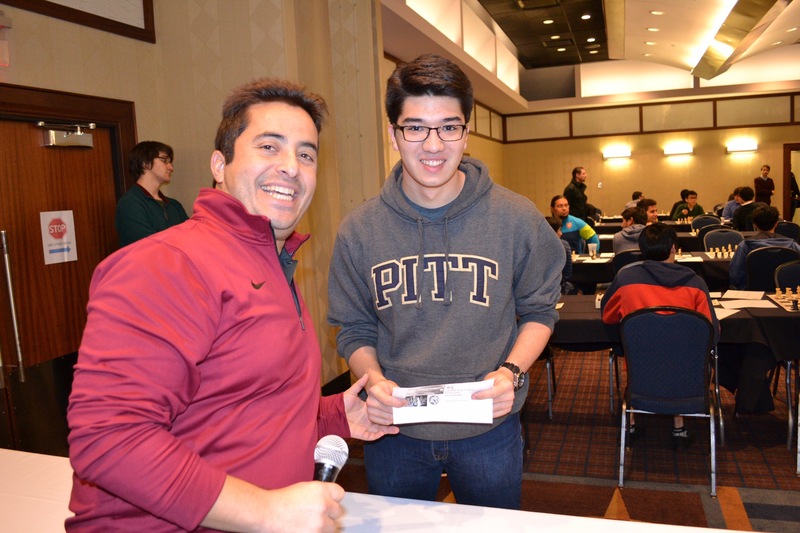 A DGT board was provided for the top two boards in the Championship section and the top board of each of the other sections. Considering the cost of registration, the chess rate, and the quality of the hotel, I thought that this tournament was extremely well run. 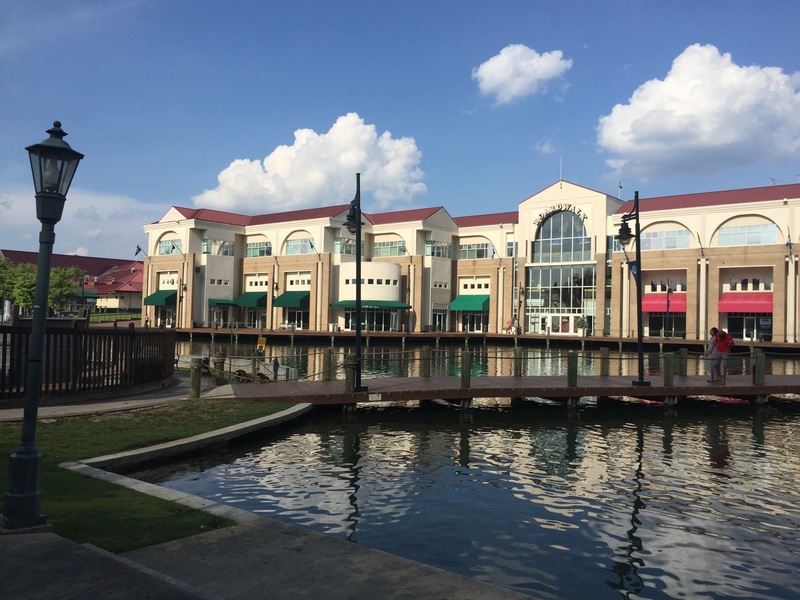 The surrounding area was extremely accessible for players with plenty of food options and accommodations within walking distance. 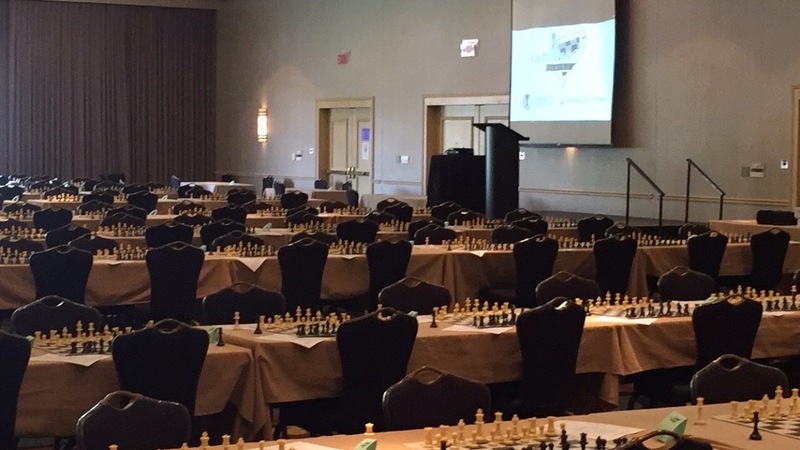 Sure, the tournament directors were a bit paternalistic at times, but on a whole, to be able to play in any FIDE event for such a low cost is a rare opportunity in the United States. My only wish was that this tournament had better advertising prior to the event. I actually found out about it by accident, and I wonder if stronger players would have participated if the event was advertised outside of North Carolina. I would recommend this tournament to any serious chess player, especially those looking for FIDE rated games. That being said, here were some crucial moments of my tournament. Beware of the Exchange Sac! 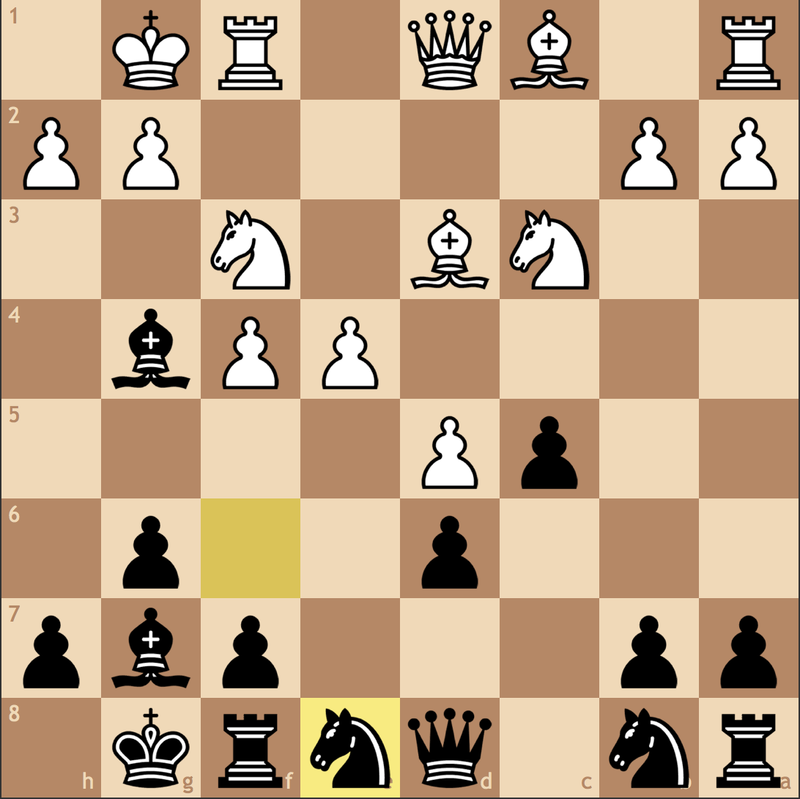 On face value, Black’s position looks dangerous. 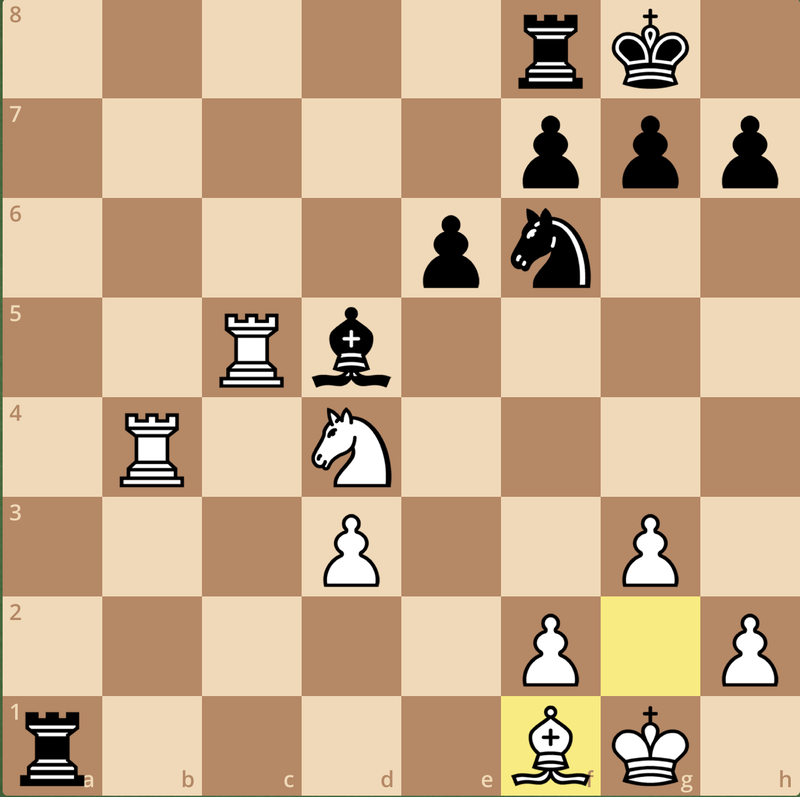 I have a weak c5 pawn, and visually, I am at a developmental deficit. However, with my opponent’s king in the center, I had anticipated this and my position sprung to life! 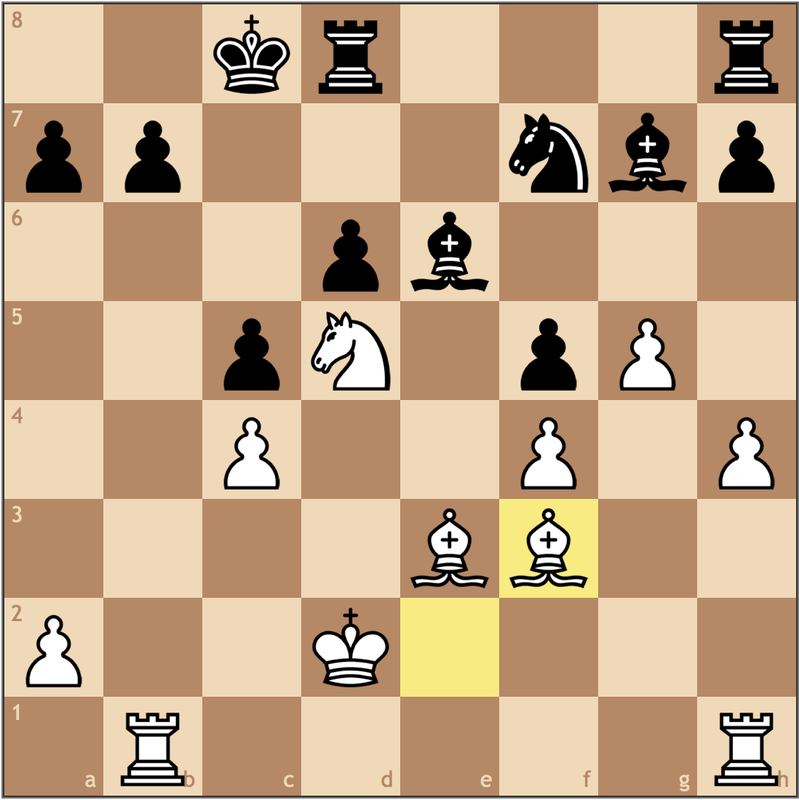 Again, still visually unconvincing, but trust me the bishop on c5 is worth more than the f8 rook! 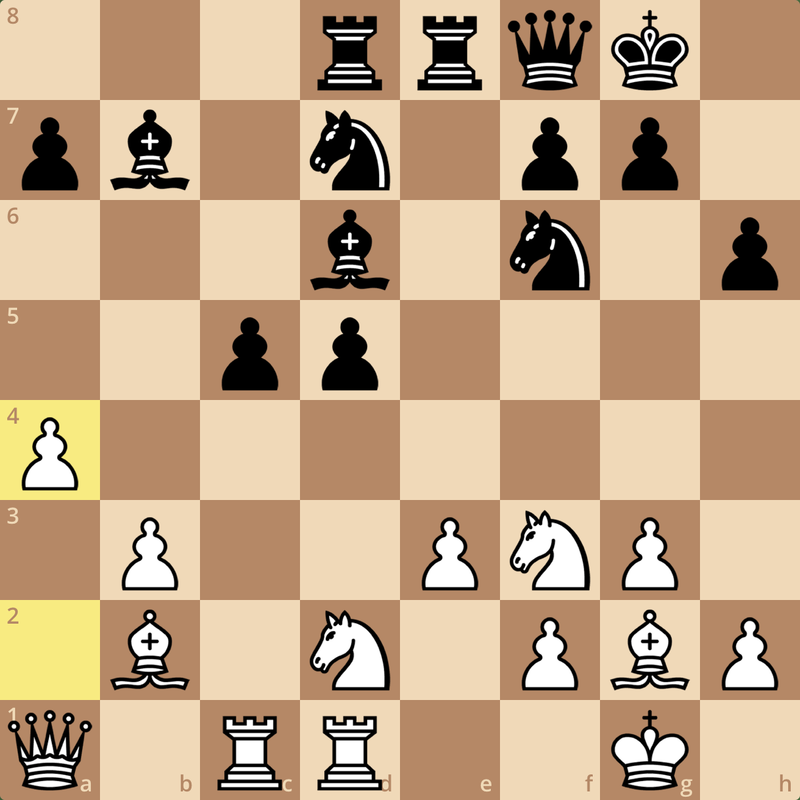 In White’s effort to attack, he left his king open for my knight’s infiltration. I’ve never really been known to hesitant sacrificing the exchange, and here’s a great example why. 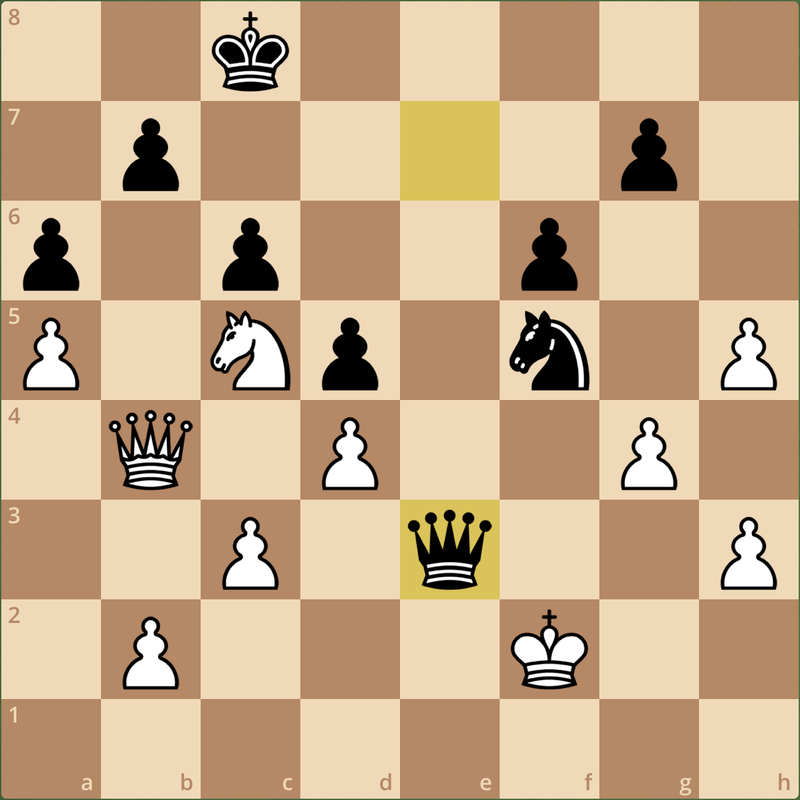 Black now has the bishop pair and an extra pawn, but the e4 pawn is destined to fall, so a minor piece and two pawns are more than enough compensation. 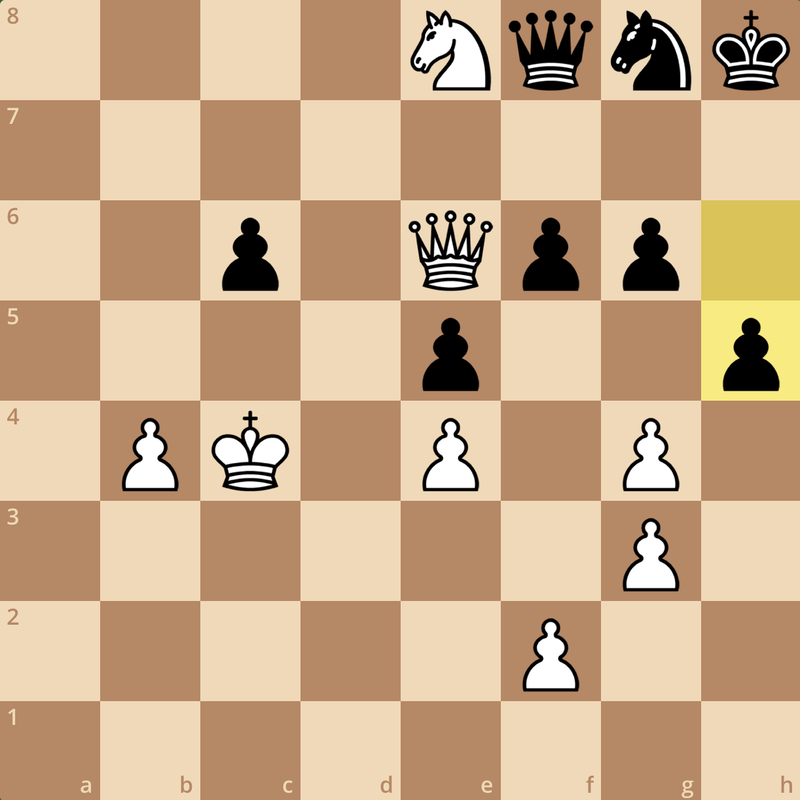 Furthermore, the bishop on g7 is holding the knight on d1 in place and it’s now White that lacks activity. My opponent decided it was too much to hold on to b2, and gave me the pawn, but this game me a pawn majority on both sides of the board and I was able to convert the endgame (though it was not without difficulty!). 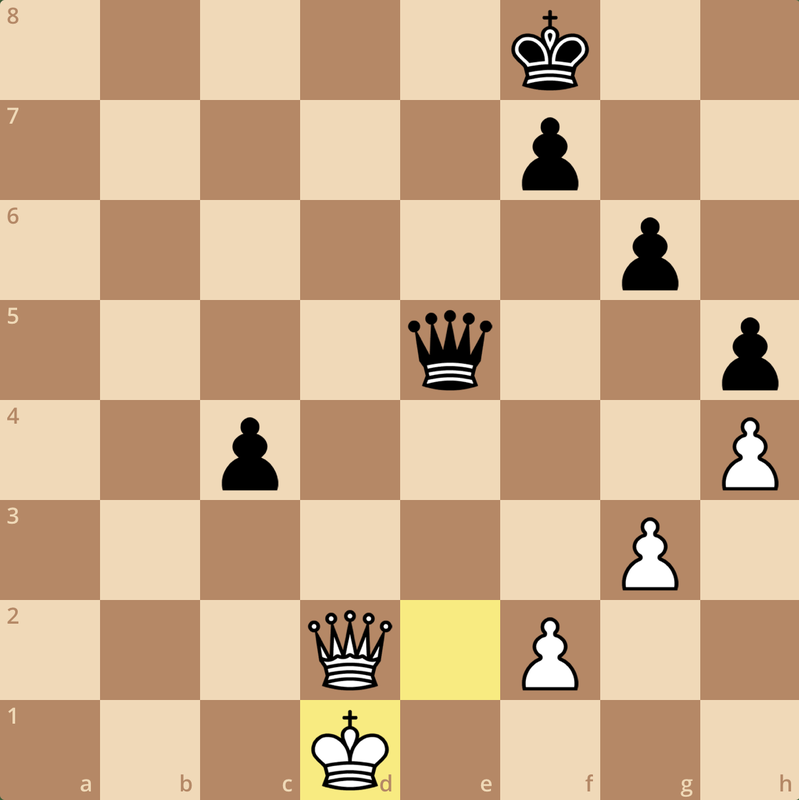 My opponent did well to bounce back, winning the next three before drawing tournament winner Grandmaster Elshan Moradiabadi. Triumph in the first round offered a deja vu to last week’s tournament. Now it was my duty put it behind me and start round 2 with 0 out of 0! 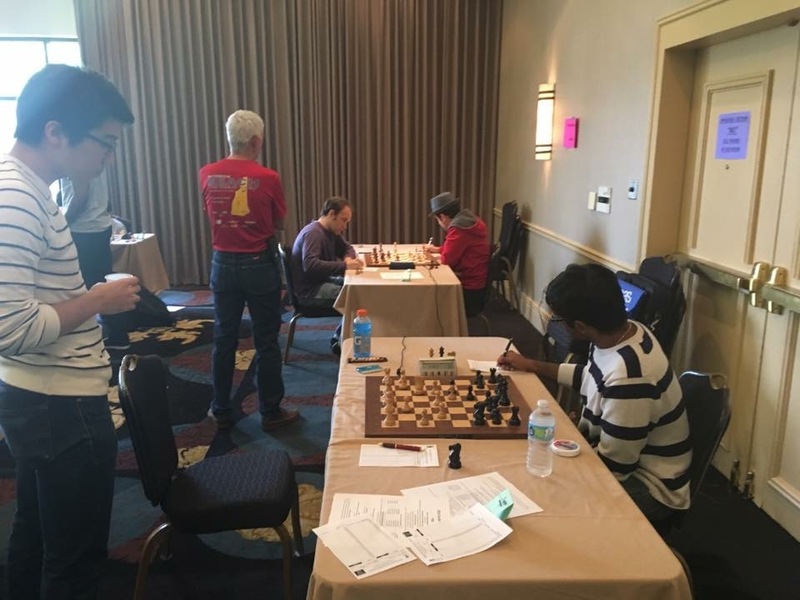 The second round also gave me an interesting match up (again on DGT), paired with the 2012 US Junior Open champion and University of Texas graduate Karthik Ramachandran. This match-up was extremely close, and I think it could have gone either way, but unfortunately in sharp positions, usually there can only be one winner! I’m still in the process of trying to figure out what happened in that game, so rather than sharing a critical moment of the game, I’ve decided to share an instructive one. For those of you who would like to see the game in its entirety, you can find it here if you scroll down towards the bottom of the games list. Even though I lost, I was really proud of how I fought in this game. I have sufficient counterplay for the pawn. 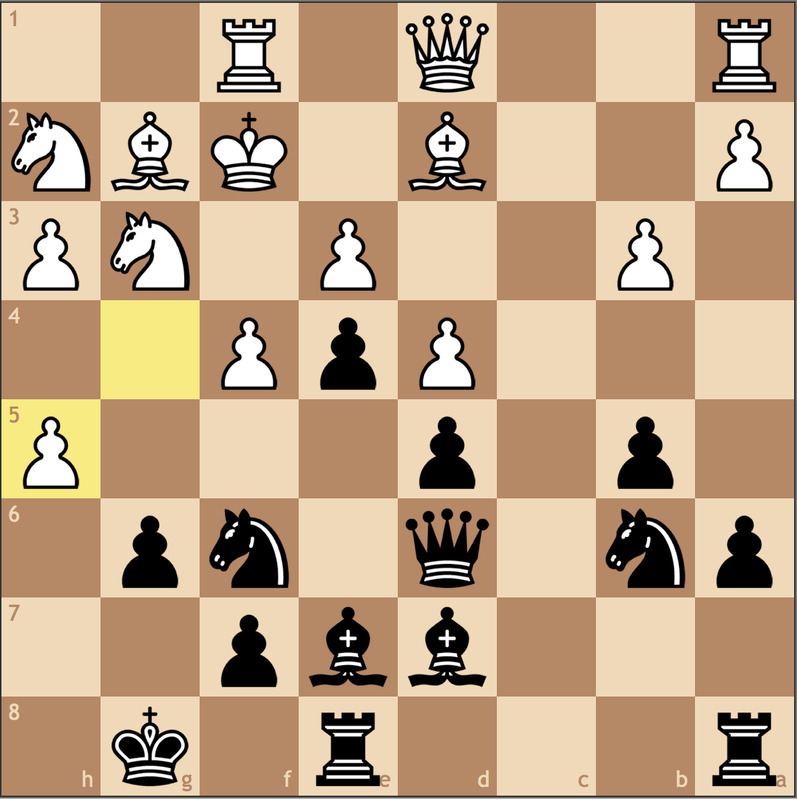 If Black tries …b7-b6, I can march the a-pawn to a5, and Black’s queenside collapses. 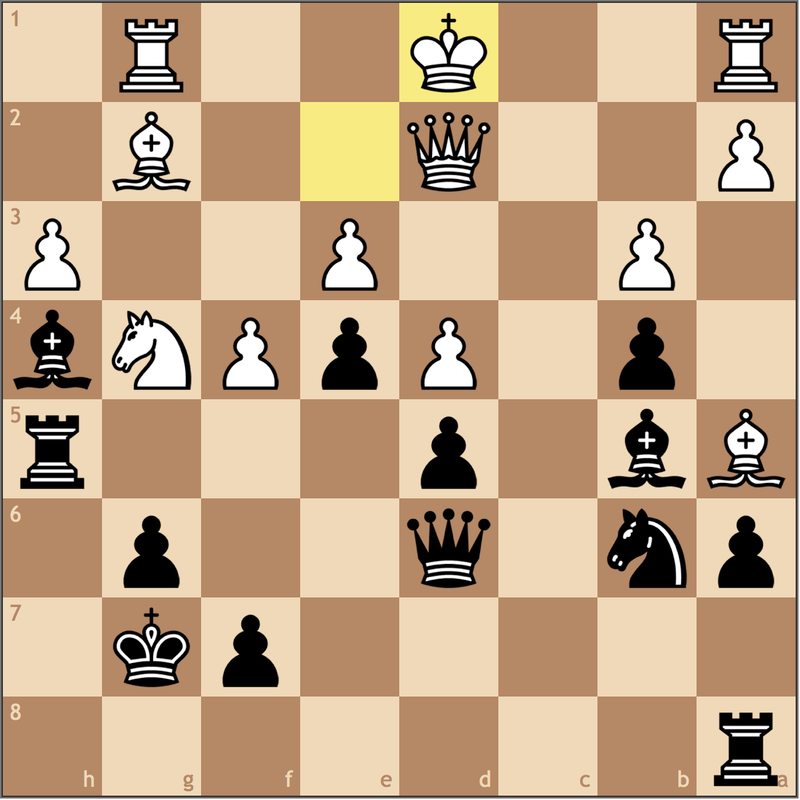 But the more complex find was if Black inserted 20… Bxd5 first, blocking my control of the diagonal after 21. cxd5 Bxb2 22. Rb1 Bg7. But now I have the resource 23. Bd3 and Black is once again in trouble. 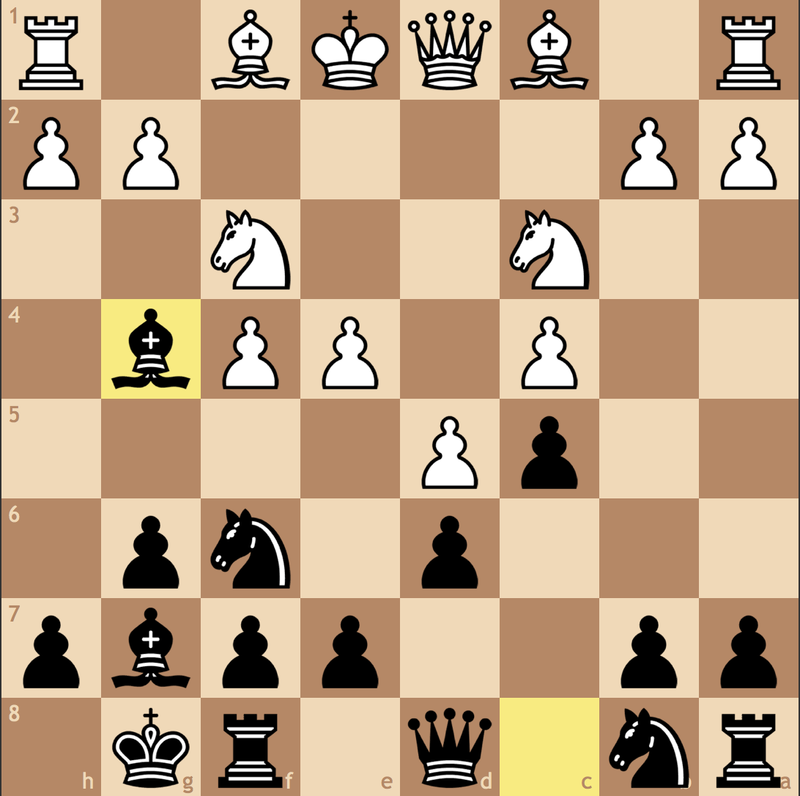 Here I have the luxury of taking the pawn on f5 immediately or waiting since this pawn also blocks in Black’s rooks. 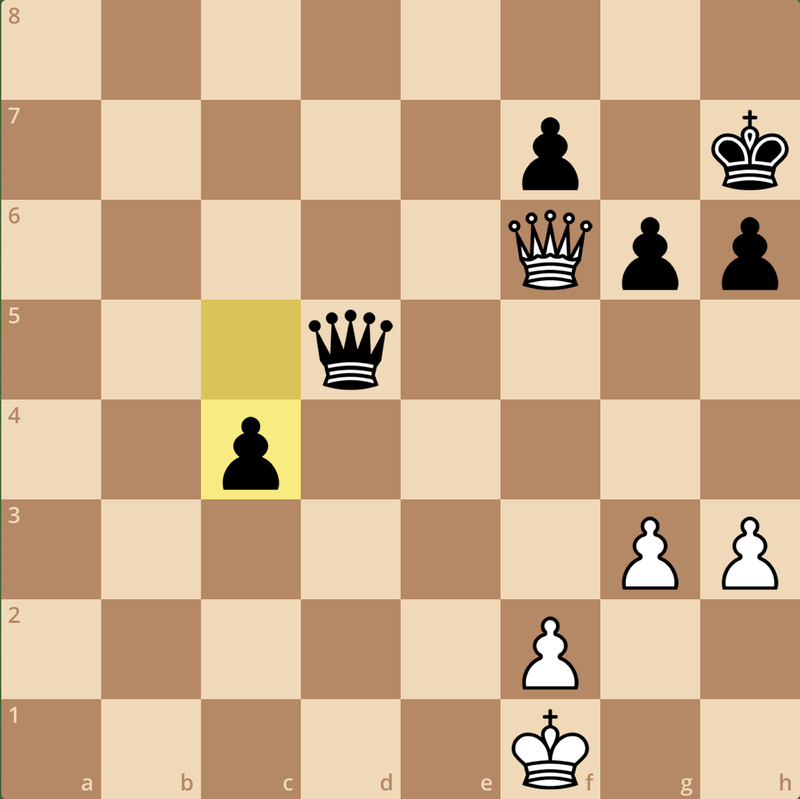 Now White can quickly play a2-a4 to stop any queenside expansion ideas and then push the h- and g-pawns down the board. Realizing this, my opponent opted for 20…Rde8 21. Bd3 and complexity ensued. As I said, I unfortunately wound up losing this game in a pawn race, but it was not enough to derail my tournament…right? Early phases of my game with the 2012 US Junior Open Champion. Hopefully, in less than two weeks I can accomplish the same feat of a perfect 6/6 to win the tournament! At this point, I had already spent nine (!) hours at the chess board, and had little time to relax going into the next round, where I perhaps put together the worst game I’ve played in a while. My mother, who came with me to this tournament, suggested it might be because of the heavy meal I had going into the game, but honestly, I thought I just had a bad game – it happens to everyone at some point, and there’s no shame in it. Fortunately for me, my lower rated opponent was just as, or even more tired than I! 38… Rxd3!! 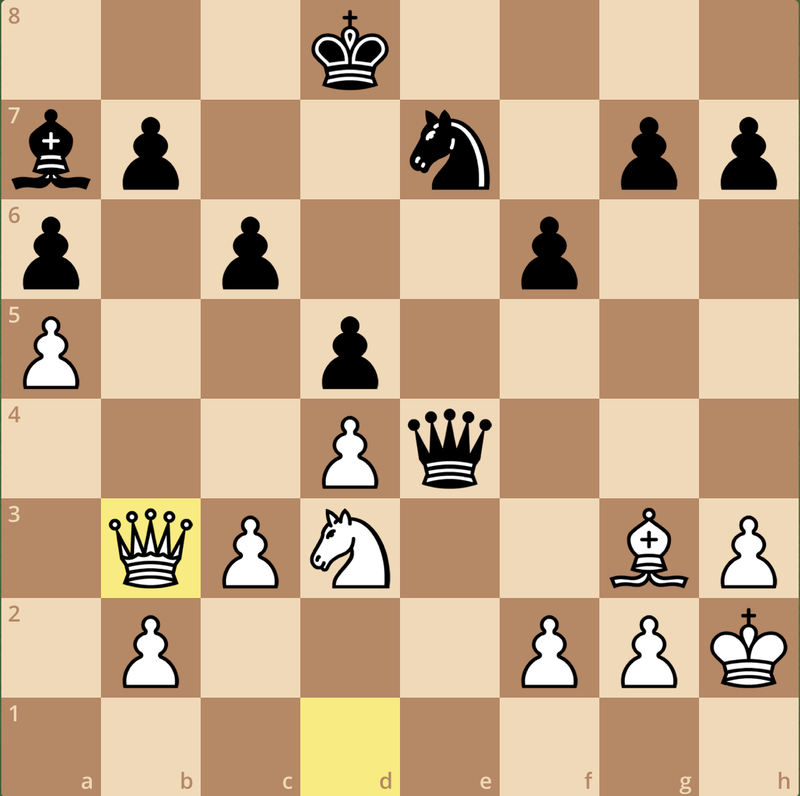 and now the position collapses since the mate threat on g2 means White must give up a piece. 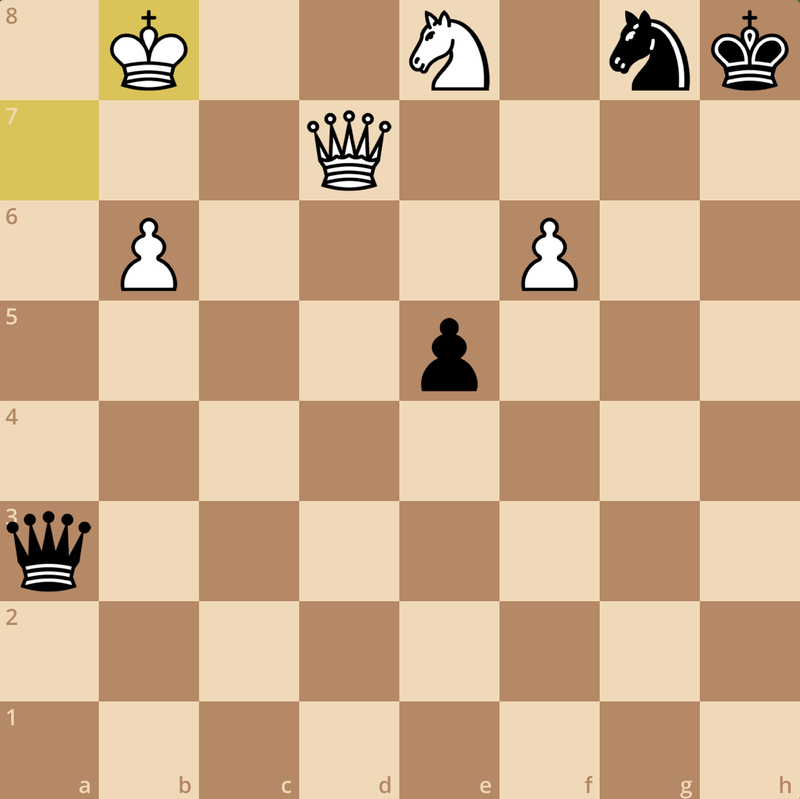 Nice move but a single move doesn’t make a good showing! 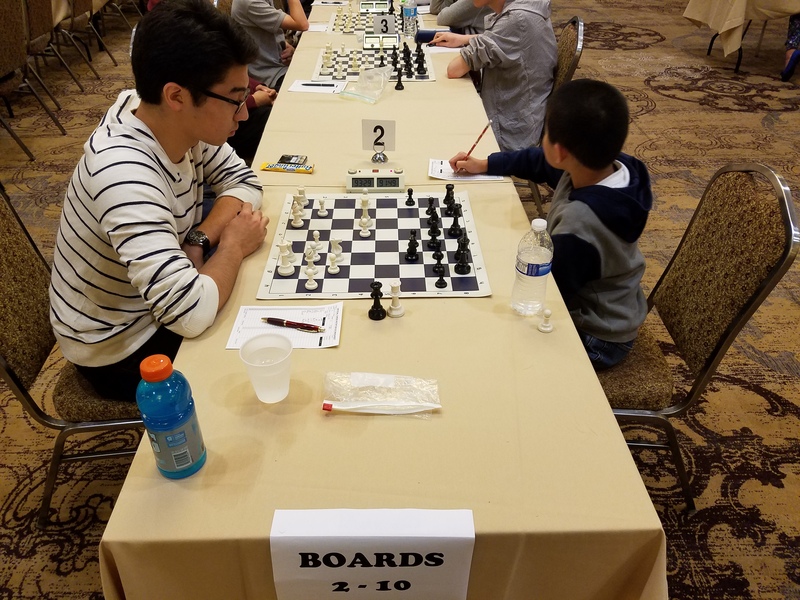 Round 4 saw me draw quickly after some experimenting with my opening preparation for the US Junior Open, though I must mention preferred my opponent’s position when we agreed on the result. However, scoring 1.5/2 in games where I felt I played less than perfectly was reassuring that even when not at my best, I can still play and hope for a result. 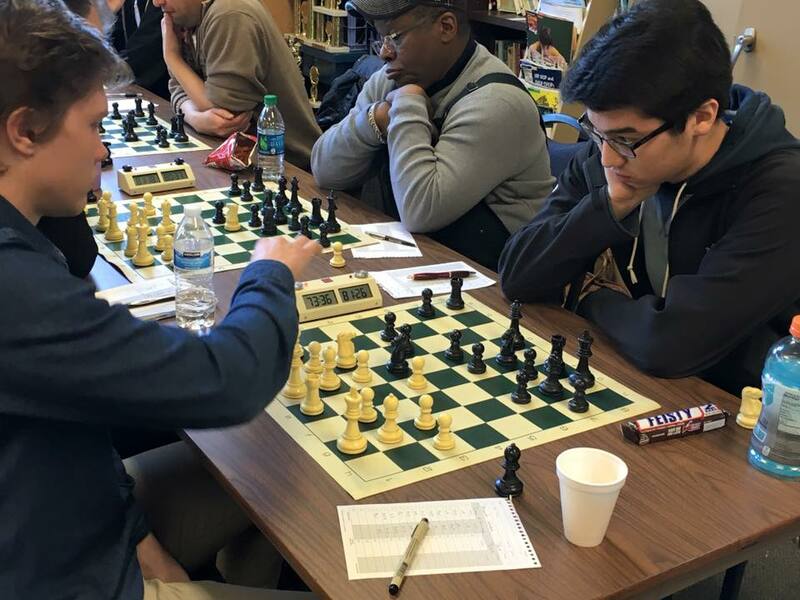 Knowing that my last round opponent would be a strong National Master (2200+), I relaxed and focused on putting my best foot forward in my last game before the US Junior Open. Moments before the start of Round 1 on Friday night. Who said cool chess piece photos were overdone? While I lost in a time scramble, I was better for most of the game, and the computer actually preferred my side of the board until the last fifteen minutes of the game as the resulting endgame was deemed as unsavory. Again, I’m still in the process of understanding everything that happened, but I had one highlight I really liked since I was extremely vigilant in defending my king. The tide has turned, and in time trouble, White is struggling to hold. With my next move, 36… Be7, White’s a5 bishop is closed out of the game and White’s rook have no real avenues of play. 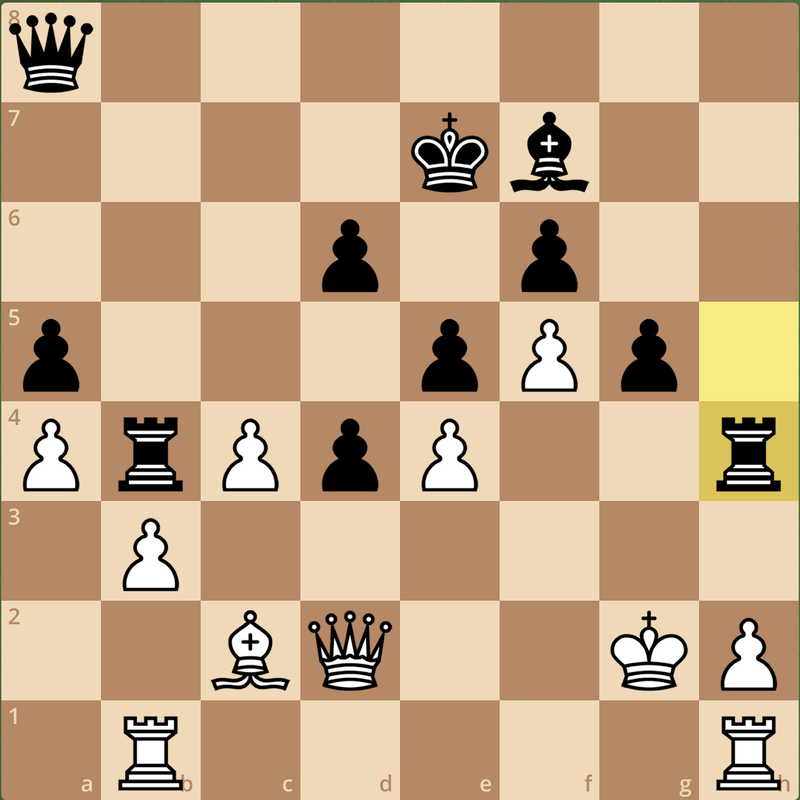 My opponent did a great job of complicating the position, and offered a draw before I miscalculated and went from winning to lost in a couple moves. Maybe I deserved to win this one, but that cannot be said about my games in the third and fourth rounds, so in a sense it balanced out. These last three weeks have given me many extremely complicated positions, and of the seventeen games, I can’t really say that any of them proved to be easy, with most of them pushing the maximum time alotment of the round. While this last game ends my nine-game unbeaten streak with Black, I think my games with each successive week have shown significant improvement, and definetly has me looking forward to the US Junior Open in 11 days! 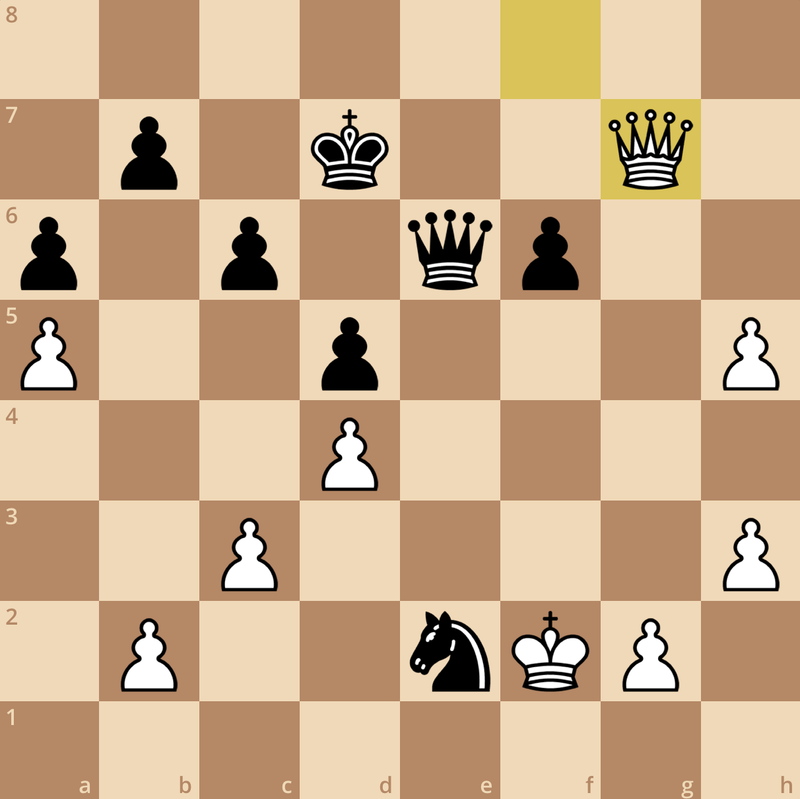 No studying for today, but already I can see plenty of tactics and endgames in my near future! Again, I can’t thank everyone enough for the support over the past year, and I am really looking forward to showing everyone what I’ve learned this year in New Orleans. Over the past seventeen games, I’ve scored 9.5/17, with only five losses across the three venues. For the most part, I’d say the theoretical aspect of my training is complete, minus a few tweaks after analyzing my performances over the past three weeks. Here on out, I’m planning on working extensively on calculation since that proved to be the key determinant across all of my losses. I suspect the preparation and anticipation in upcoming days will be just as fun as my trip to New Orleans, so make sure to check back to get my final thoughts going into the US Junior Open! My coach told me to relax this week and limit my preparation for the Carolinas Classic this weekend, so for today’s video, I decided to review a free game analysis submission from a few weeks back. Interesting game, important notes on opening fundamentals – don’t miss out! 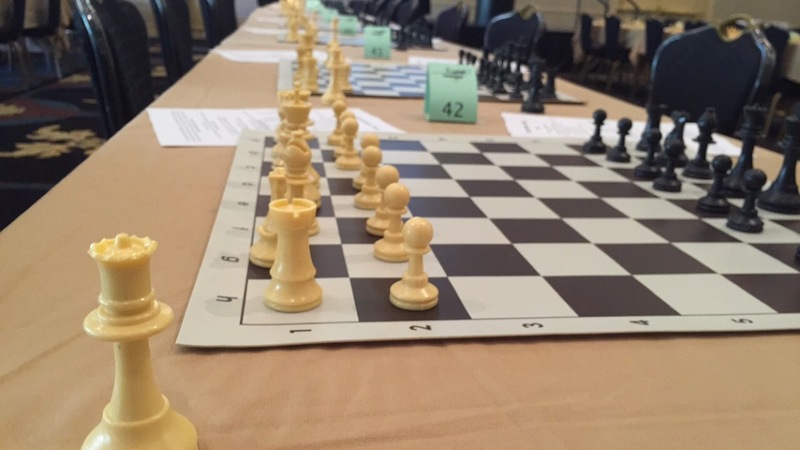 As I briefly mentioned in my last post, I will be adding new authors to Chess^Summit after the US Junior Open. In today’s video, I take a few minutes to discuss the future of Chess^Summit, as well as reveal one new future author. I have a feeling that regardless of how Chess^Summit 3.0 turns out, I think it will be a fun and exciting project to be a part of. As always, if you too would like your game to be analyzed, make sure to send your game PGNs to chess.summit@gmail.com, and I’ll try to go over it here on the site – either in article or video form. That being said, I hope you enjoy today’s video, and make sure to check back next week to hear about my results in Charlotte!